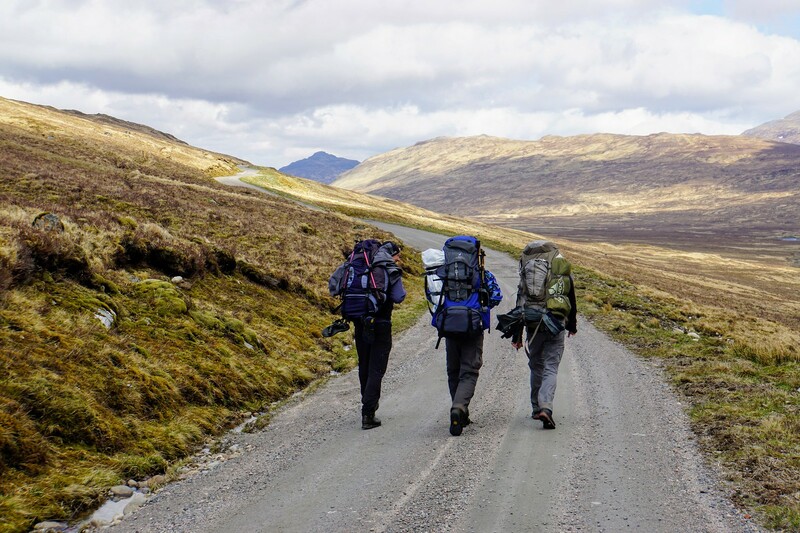 This year is the 8th time that my mates and I travel to Scotland for our annual 5 day walking trip. As usual we booked flights early in February with no idea what the weather will be like in the first week of May, our week for visiting Scotland. That was 3 weeks before the start of the tour. The remaining weeks were busy with work and there was not even enough time to eagerly anticipate the tour. There were also a few changes to the crew compared to the last years. One of our mates had a torn ligament in one foot and wasn’t sure whether you could climb the mountains but wanted to give it a try and our oldest mate wasn’t able to join because he was on a holiday trip with his camper van. On the other hand another friend got all-clear from his local government and was able to join. We convinced him by describing in colourful words how great, wonderful and relaxing the last tour was and so he joined us on this trip. As last year my rucksack was 15kg but without food, water and tent. Our tour began with a long drive to the airport (yes, Berlin Schönefeld the old east german airport because the new Berlin Brandenburg International airport that was due to open back in 2012 is still closed). As usual we had a Guinness in the local pub and boarded our flight to Glasgow. The flight was ok, everything went well, our rucksacks arrived and we headed for the rental cars office to pick up our car. The very friendly girl behind the desk tried to convince us to upgrade the VW Golf to a Volvo V90 for just £24 per day but we weren’t interested. 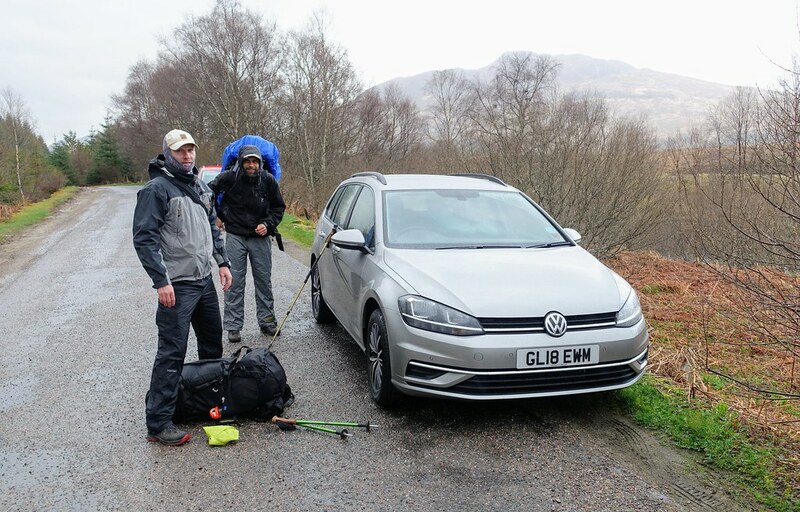 The Golf was spacious enough for us and soon after we headed for Perth were we stopped at the local Tesco and bought the usual stuff: bread, couscous, water, beer, whisky, porridge, ham, honey, noodles and a lot more that added around 4kg to each rucksack. After Tesco we drove to Tiso. Here we acquired gas canisters and a map and withstood the urge to buy more shiny, new outdoor gear. Next stop would have been the usual Burger King in Inverness but that would have been a long detour and so we found a McD in Perth were we had our last meal. Burgers, chips, Coke so all in all just a huge amount of calories that we would need for the next days. 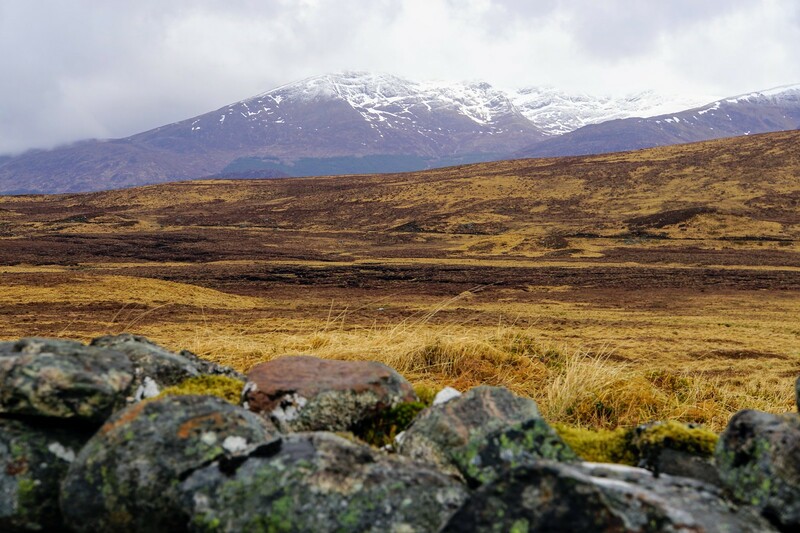 We drove north along the A9 and close to the pass of Drumochter the first rain shower caught us. 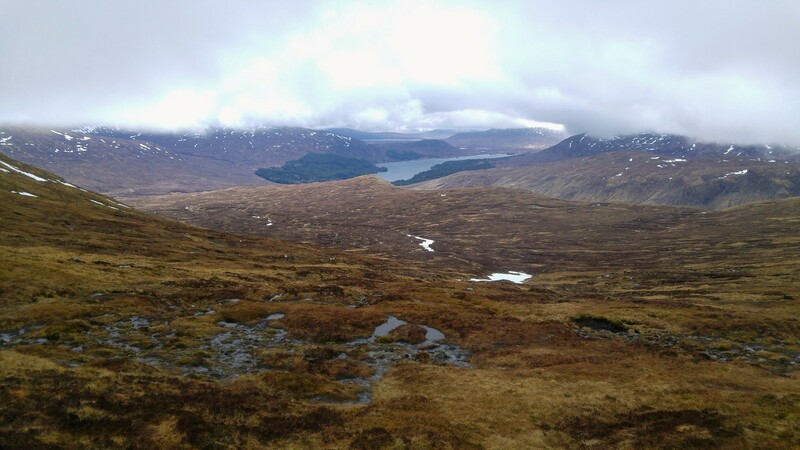 Next left to Dalwhinnie and the to Loch Laggan. We stopped at the layby next to the bridge where the forest track to Corrour forks off. The last thing to do before we could finally start was to repack our gear, the food, the water, everything had to go into our rucksacks. Space was not the problem but the weight was. 20kg had each of us in the end on his back. 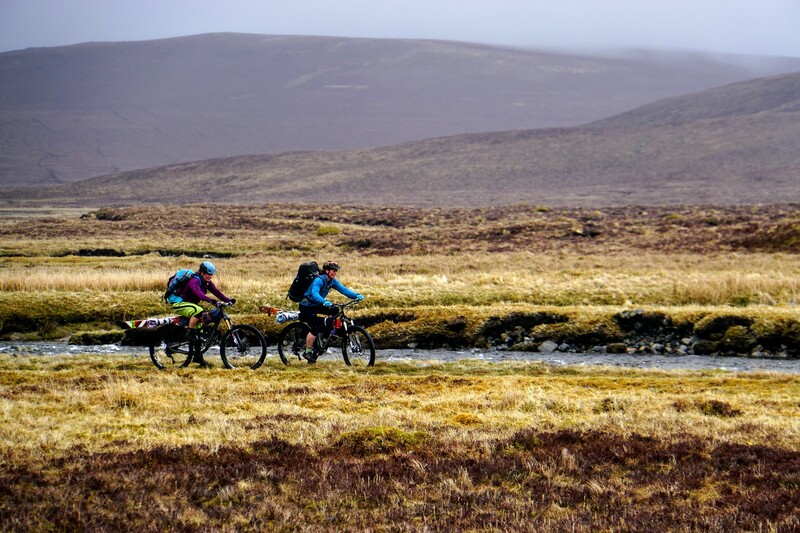 We started at 8pm and followed the track for a some hundred meters and soo realised that we missed the right track when we crossed the Abhainn Ghuilbhinn river. After heading we found the track up to Lochan na h-Earba (who comes up with these names?). A couple of minutes into the walk we had to get our rain gear out. It was drizzling. Not the best start but the forecast for the next days wasn’t good either. Rain showers to light rain, wind and overcast along with temperatures from 0 to 10°C. 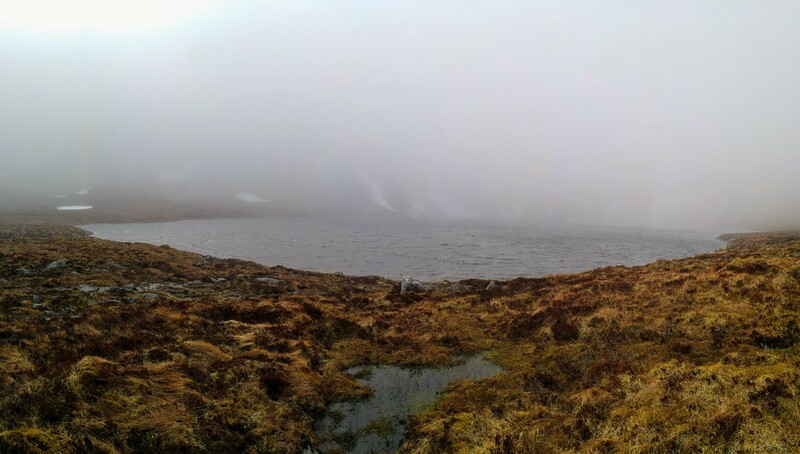 The closer we got to the Lochan the stronger the wind got. Initially we intended to place our tents right on the shore but the wind was too strong so we continued along the track to the south and soon found a suitable place not bigger than an average living room surrounded by walls. Maybe an old sheepfold? The walls offered shelter from the wind but it was still drizzling and by the time we had put up our tents it was already darkening. So we shared a beer and went straight to bed. The day started at around 8 with wind. 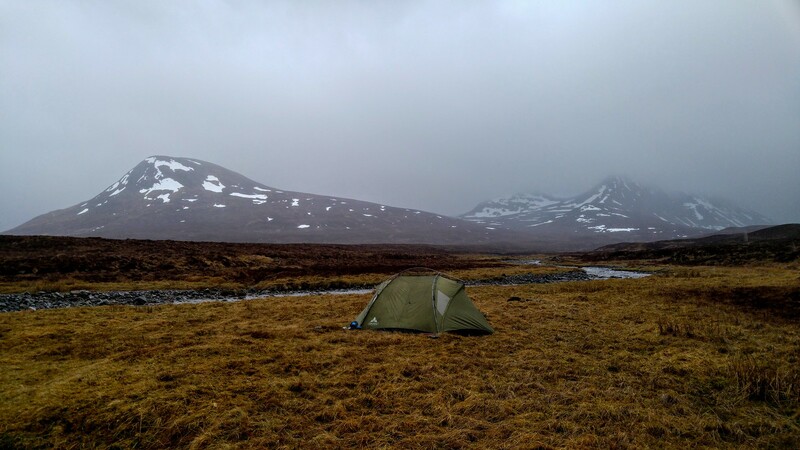 I don’t know how many times I turned in my sleeping bag during the night but almost every time I heard rain on the tent and so I was surprised to find the morning to be without rain. But the first morning is always a bit chaotic because body and mind are still in the comfort zone and leaving the sleeping bag equals leaving the comfi zone. After a while especially after hearing chatter from the other tent I got up and quickly boiled some water for a coffee. The breakfast was the usual diet that we always enjoyed while in the Highlands: bread, cheese and ham, porridge. The next morning. Not very different from the evening before. Lochan na h-Earba. 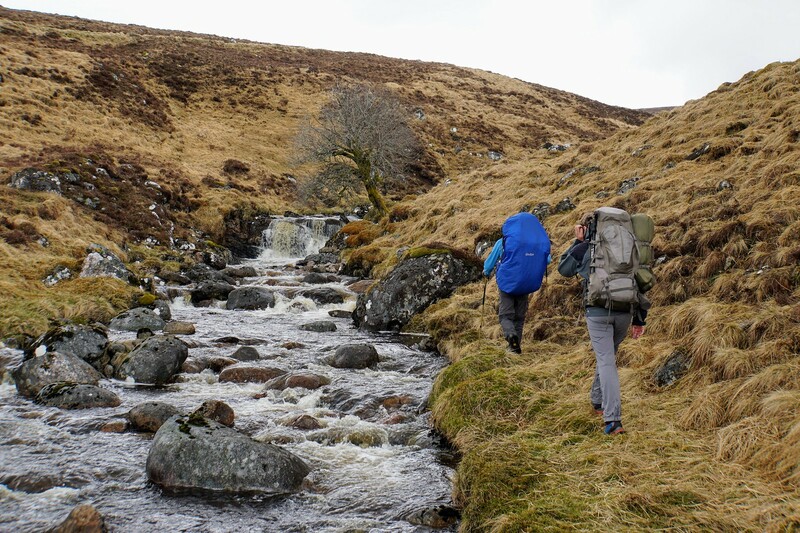 After packing our stuff we started along the burn because due to the rain it had risen and the place where we had crossed it the evening before was now flooded. 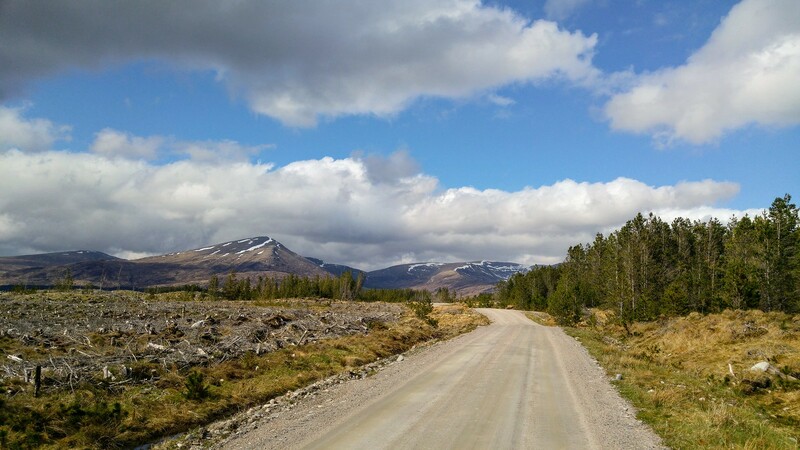 A few hundred meters up the hill we finally found a place to cross and followed then the 4WD track along Corrie Pitridh up to the bealach. In front of us were 2 walkers, apparently a father and his kids but they were too far away and did not stop for a chat. They were the only people we saw that day. On the bealach we hid our rucksacks behind a large rock and headed for Creag Pitridh, the lowest and closest of the three Munros around. 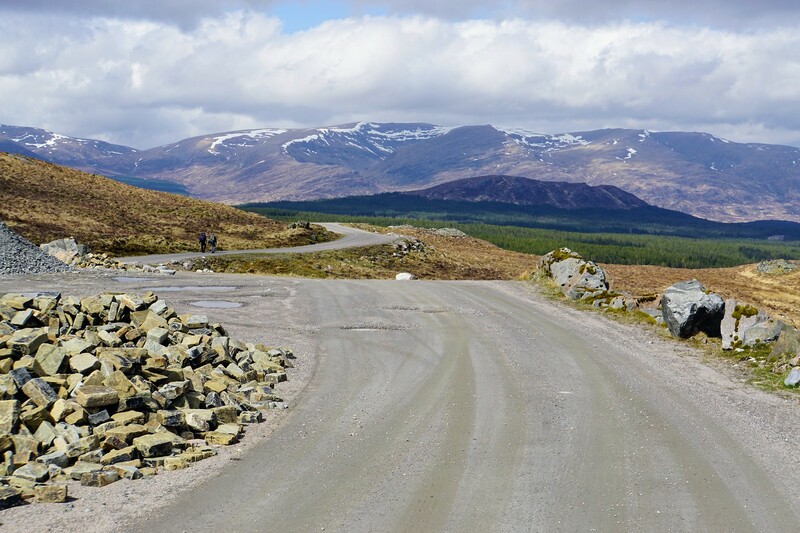 The ascent was straightforward and 170m of ascent from the bealach to the top was quickly over. 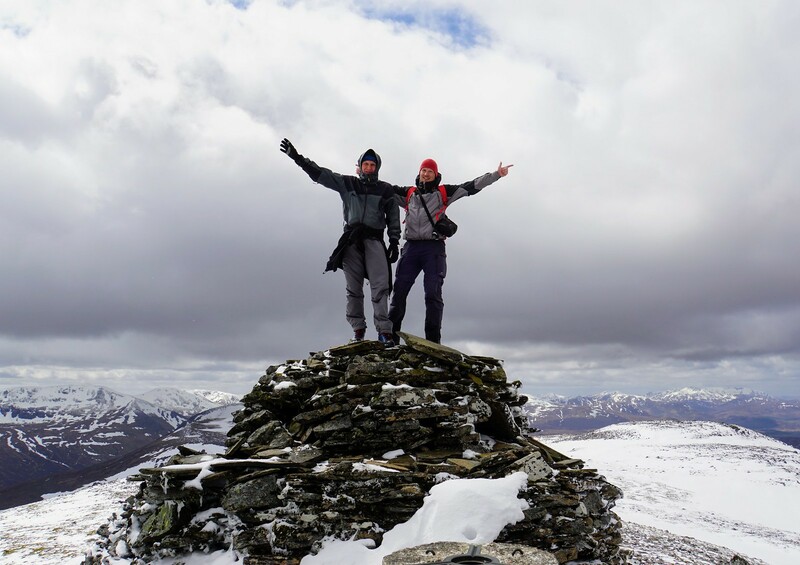 Here we were on top of our first Munro this year, enjoying the wonderful view onto the surrounding mountains, lochs and glens. I had brought not only a bottle of Whisky to celebrate but also a flag. 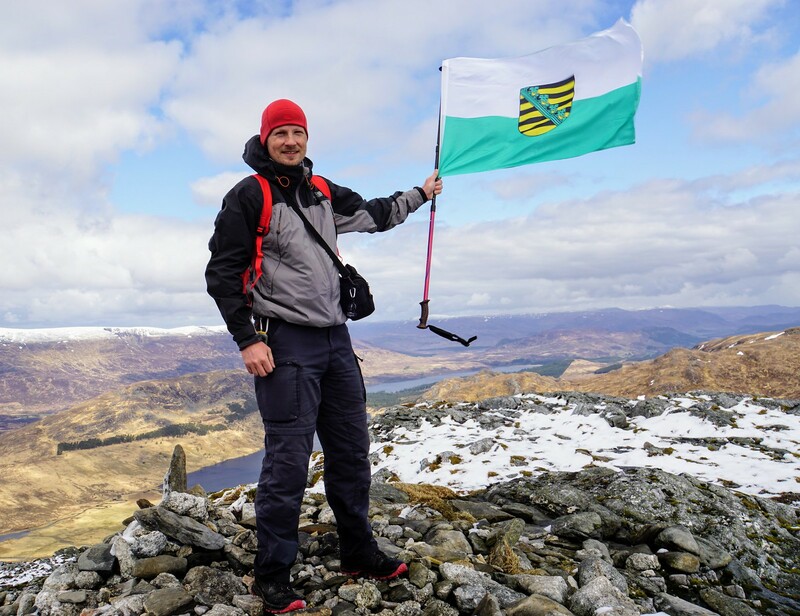 Sorry, not a Scottish Saltire but the flag of Saxony where we come from. 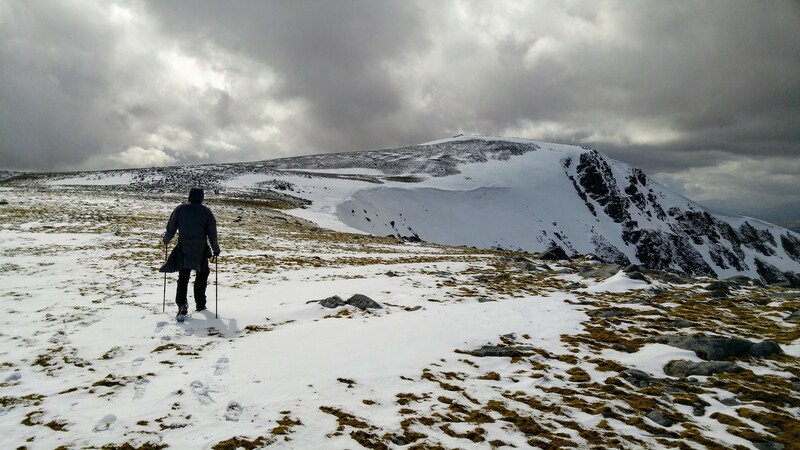 Creag Pitridh is the lowest of the three Munros but offers the best views so after hanging around for a while we continued to Geal Charn, 2km to the east. 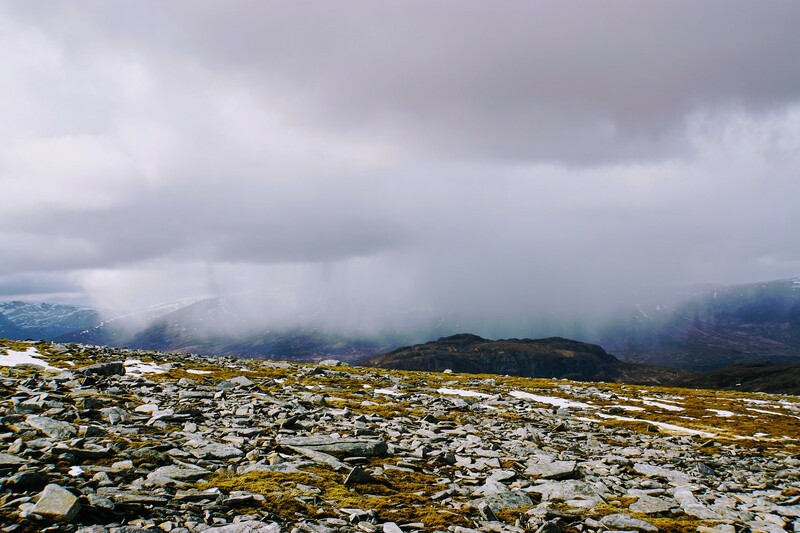 While Pitridh was almost snow free we soon encountered the first snow fields it wasn’t long before the ground was completely covered by snow. 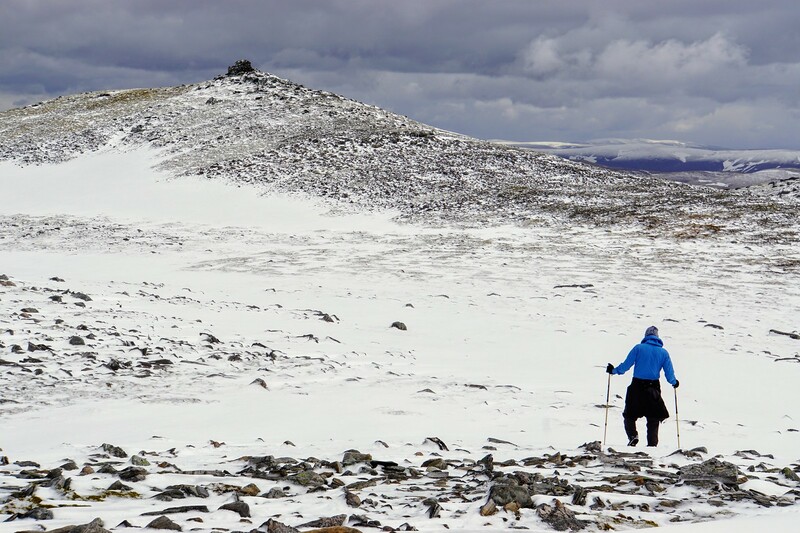 The wind also increased and so we scrambled uphill to the cairn of Geal Charn. 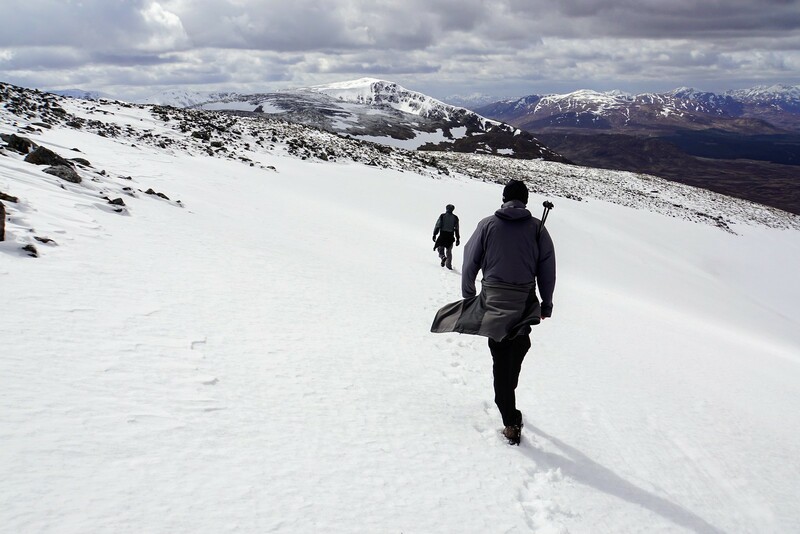 It was quite cold and unpleasant at the top so we did not hang around but headed back to the bealach to collect our rucksacks. At the bealach we stopped to enjoy the view on Loch a’Bhealaich Leamhain and the distant Loch Pattack und we then followed the path to the east but stopped after a kilometer and left our rucksacks behind a rock. 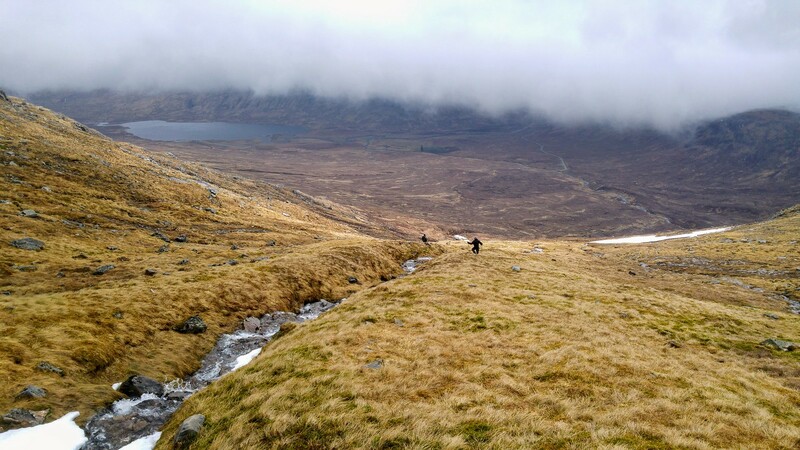 The initial ascent to Beinn a’Chlachair was steep but a faint path made walking rather easy. This changed when the path faded out shortly before the plateau. From here we had to cross a flat but huge field with small rocks which made walking strenuous but after a while we reached the cairn of Beinn a’Chlachair. The view to the south was amazing and we could see the Munros we wanted to conquer in the next two days. 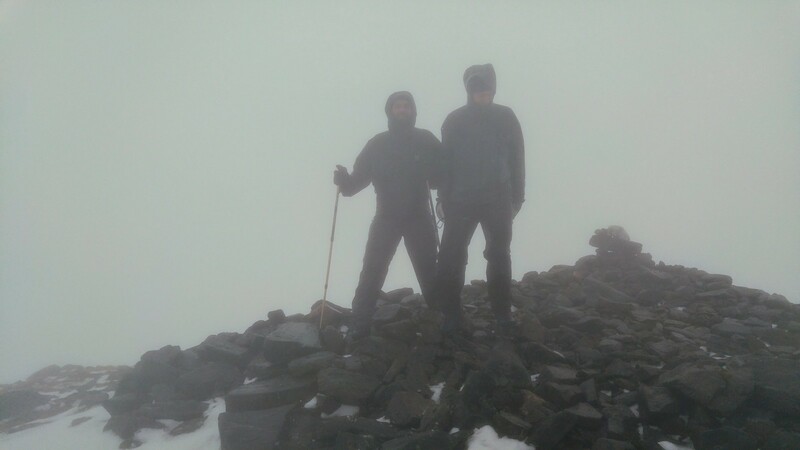 When we finally left the summit, the wind had increased and blew us back to our rucksack hiding place in no time. So that were three Munros more on our list and now it was time to get to our intended campsite near Culra bothy which was still some 6 or 7 km away. 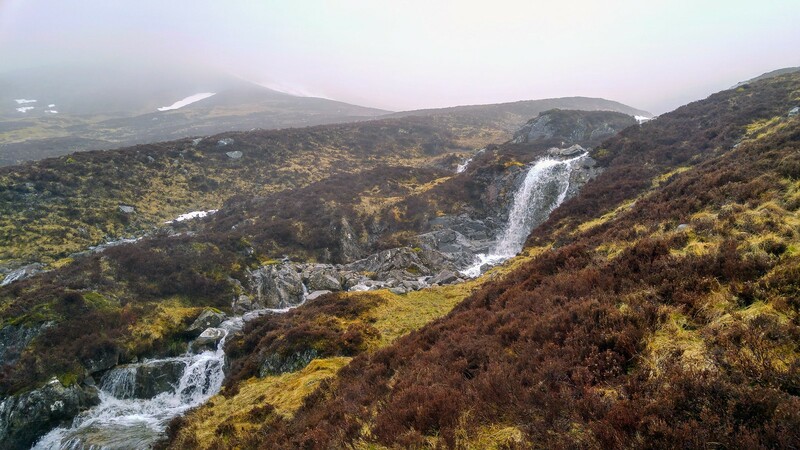 We also agreed on boiling some water for a soup and coffee but due to the wind we decided to find a suitable spot down in the glen. 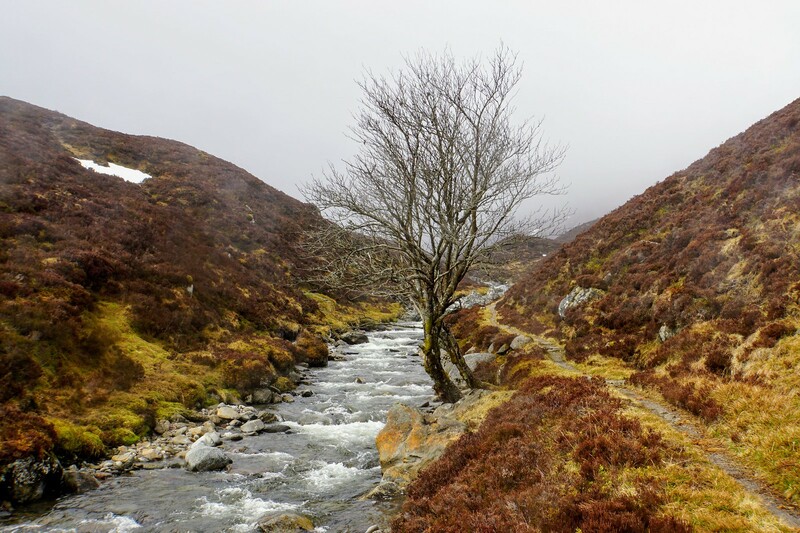 So we followed the wet and boggy path down to Allt Cam but without finding a place to rest. 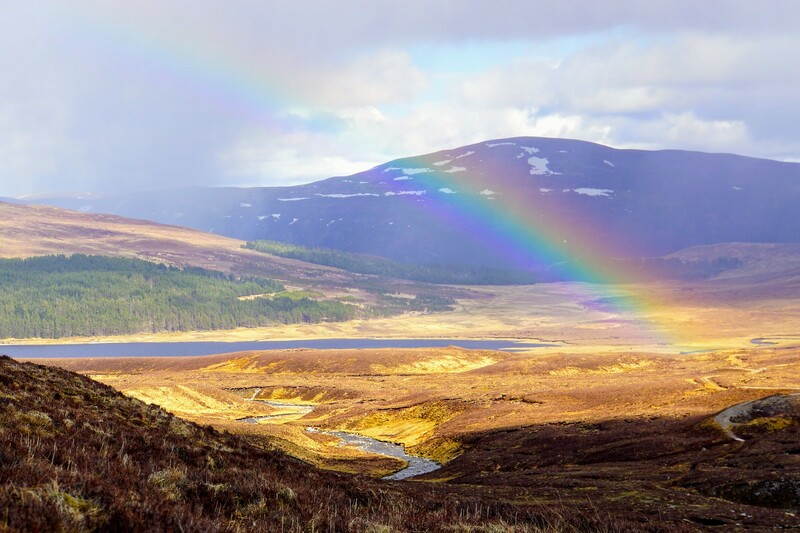 In the distance we could see a rain shower over Loch Pattack and a beautiful rainbow. 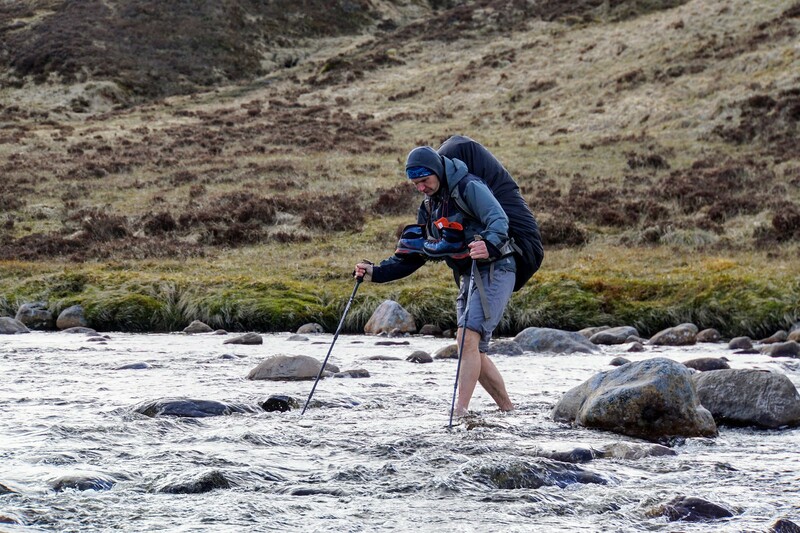 The sheer size of the burn Allt Cam surprised us and we realised this meant wet feet for us. So we took our boots off and crossed the burn in sandals, crocs and trainers but no matter what, the water was still icy. Ever heard of Kneipp cure? Germans love it. This crossing should be enough for one year. The planned coffee break had to be postponed due to wind and later rain. 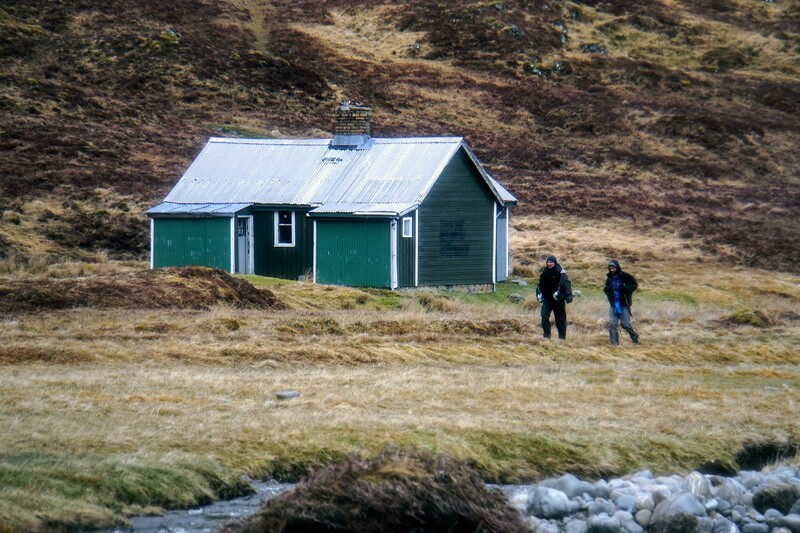 When we arrived at the bothy we had a quick peek inside and would have loved to stay there but the warning written on the door in bold letter “BOTHY CLOSED! ASBESTOS!” kept us away (at least for today). The tents were quickly put up and inside we waited for some time for the wind and rain to stop but after a while we all four of us sat in the bigger tent to eat some noodles before retiring to bed. 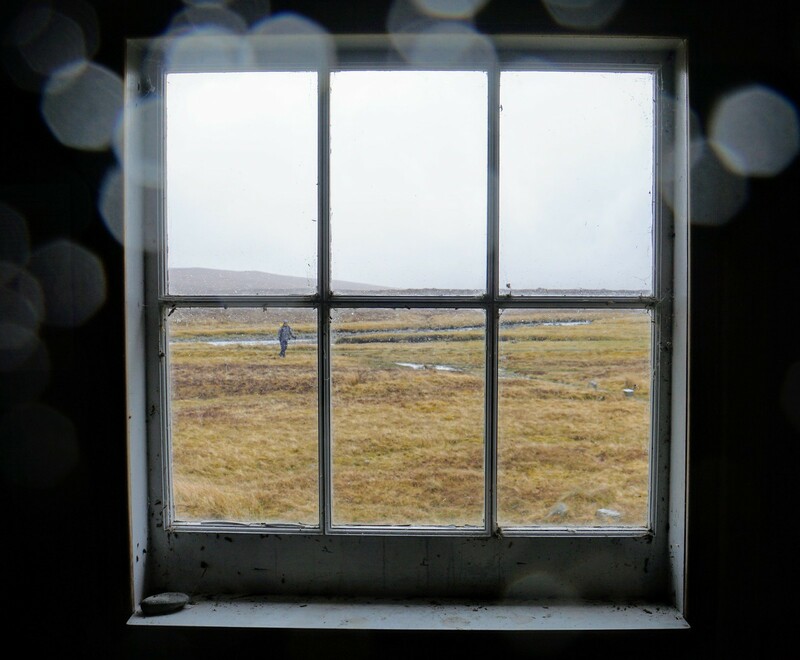 At the closed Culra bothy. The next morning was not exactly what we had hoped for or what the forecast had predicted (two days ago). It was still drizzling but what was worse were the cloud the were hanging at around 700m. Carn Dearg right behind the bothy was in the mist and so were all the other peaks around. The next morning. See the difference. During a short breakfast we discussed what we could do today and decided to give the planned round of the 6 Munros a go. We were here with a limited amount of time and had no time to waste. An for the views, well we could read a couple of trip reports later at home and look at the photos to see what the view would have been. 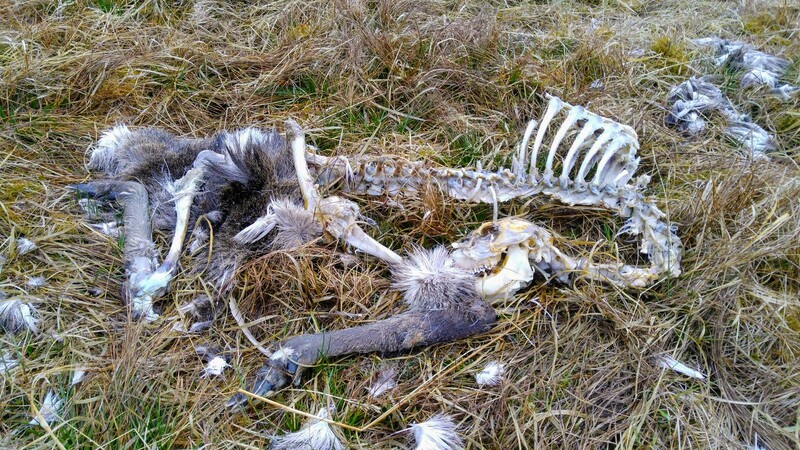 With that decision we started, had another quick look into the bothy and while being inside saw something really strange. Outside in front of the bothy was a small group of mountain bikers with ski and boots attached to their bikes. We were not able to find out what they were up to but skiing conditions were probably not that good today. Well, if someone could explain that to me, I’d be grateful. Ski-biking? We were not able to find out what these ladies were up to. 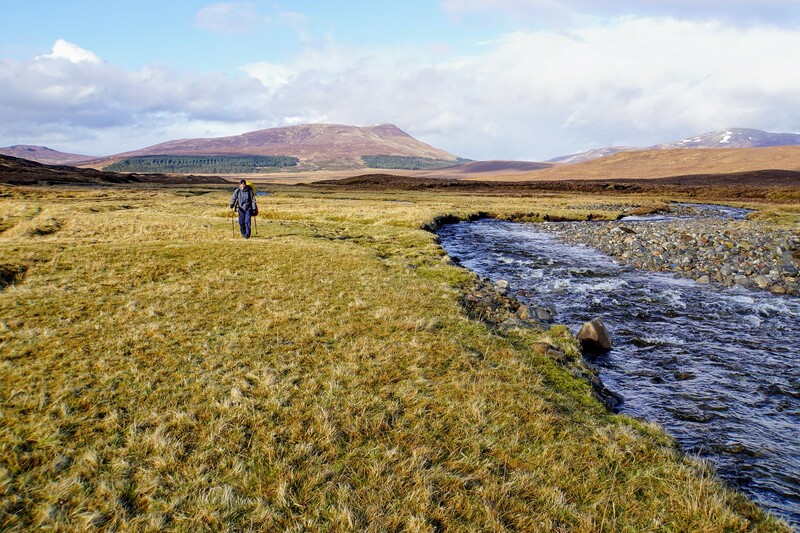 We crossed the river at the bridge NE of the bothy and followed the path for Loch a’Bhealaich Bheithe. 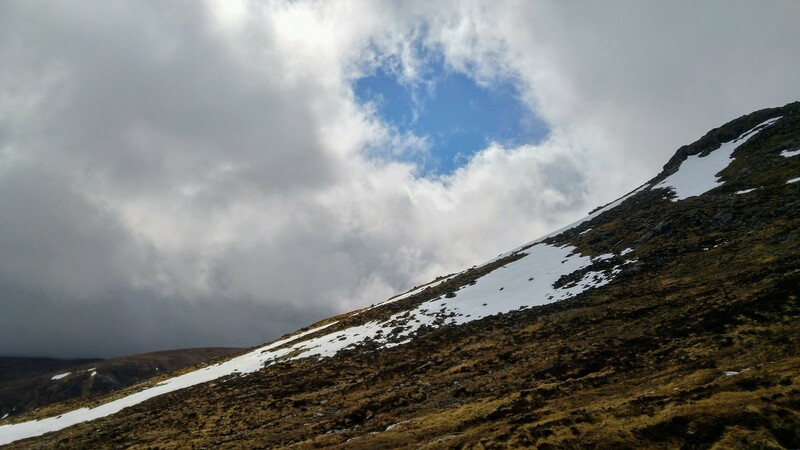 At around 650m we left the path and headed directly for Beinn Bheoil and scrambled up its north flank close to Sron Dreineach. Up on the ridge the view was gone but a strong wind combined with rain welcomed us. We had put on our rain gear already at the tents and by now it was more than necessary. 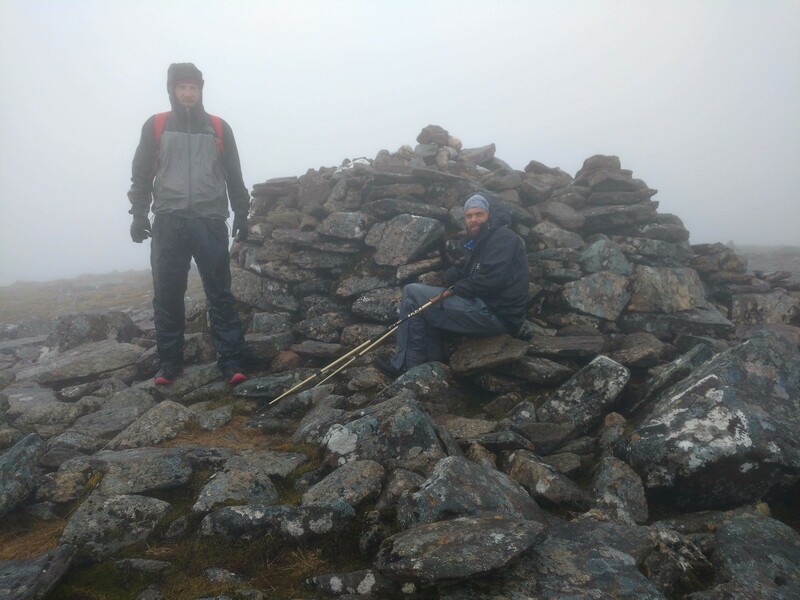 It took a while to get to the summit of Beinn Bheoil and we did not hang around for long. 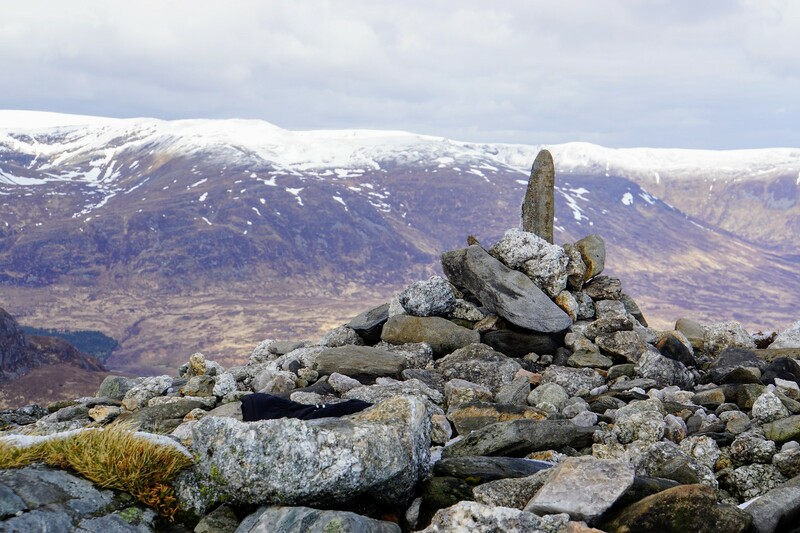 It was just a kilometer from the cairn when we lost one of our mates. We had left the summit in two groups. The first group was my mate and me, the second group the two other mates who were maybe a hundred meters behind. One of them had to find something in his rucksack so they separated. What would have been absolutely not problem in good weather became very soon a problem for us. 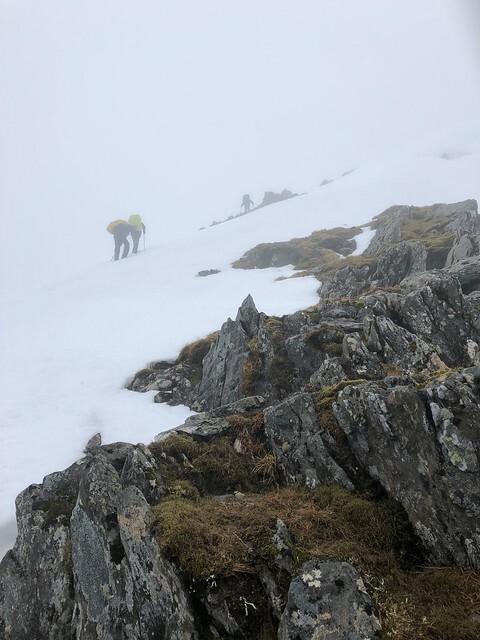 The first group had veered to the right because we headed for the bealach while the third guy followed the ridge to the top of Sron Coire na h-Iolaire (955m). He had not seen us in the mist and he had no GPS and no map. 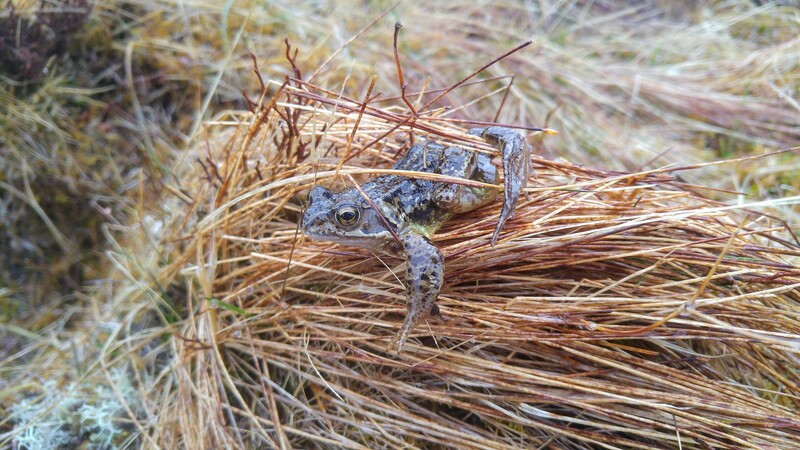 In the meantime we had stopped to wait for the others and were surprised to see just one (the last one) emerging out of the clag. The three of us waited a few minutes more but soon realised that our friends must have passed us unseen in the mist and followed the ridge. So one of us followed the ridge, one turned back while I waited where I was. Within a couple of minutes the missing friend came back because he had seen us nowhere and realised that he was possibly wrong. And the other two where also soon emerging and we were relieved to be together again. This small incident had taught us a valuable lesson never to separate in the mist. 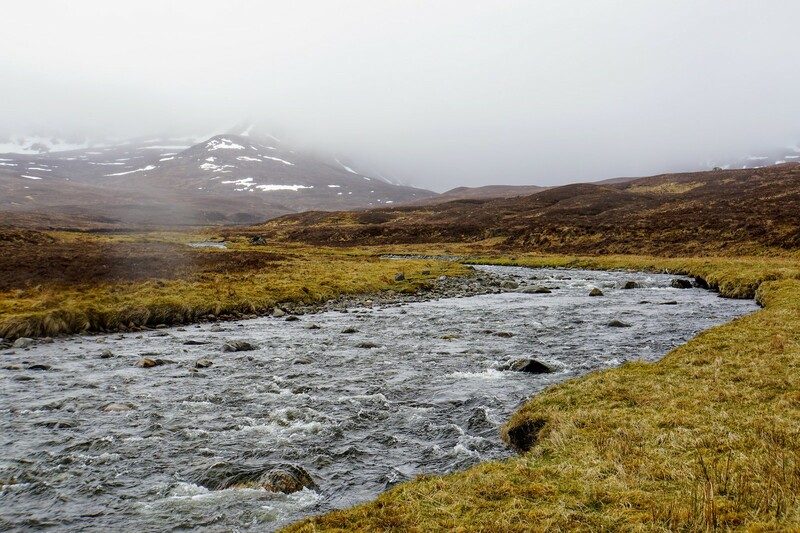 We headed for the bealach and crossed the invisible path that leads to Benalder cottage. 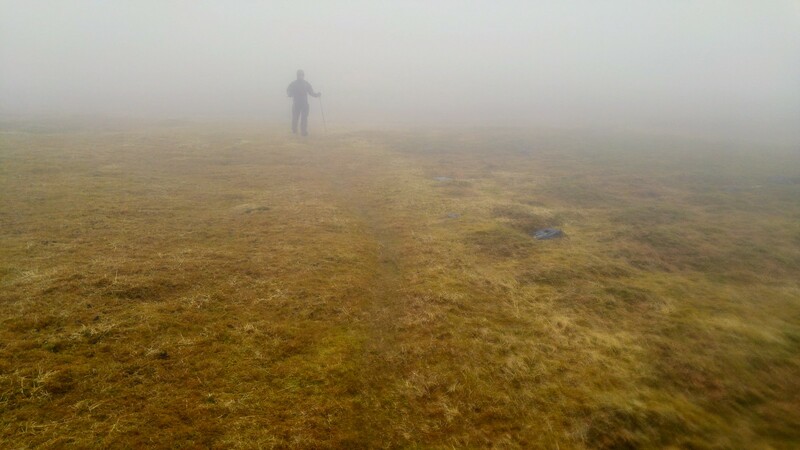 There is one good thing about the clag: We did not see how long and steep the ascent will be. 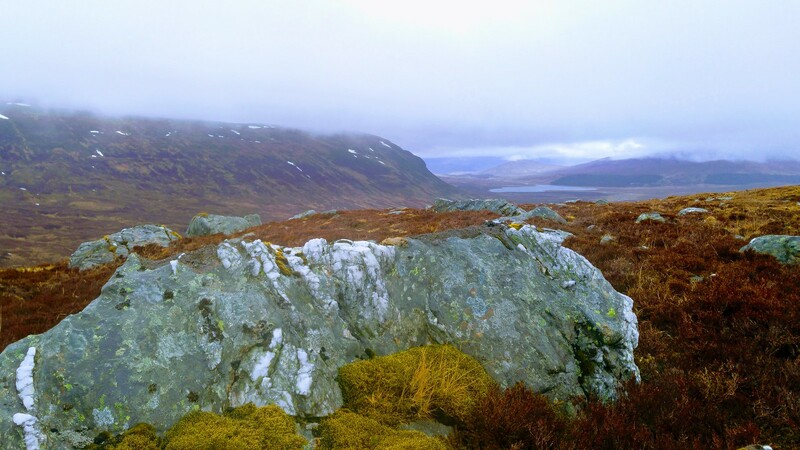 So we walked to the west and climbed the up to the Ben Alder plateau. 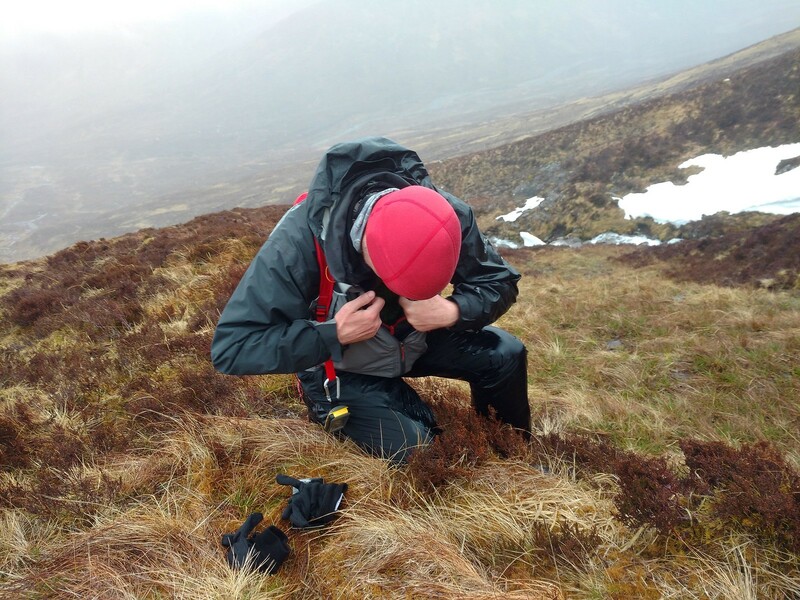 The conditions here were similar to Beinn Bheoil but also quite different. 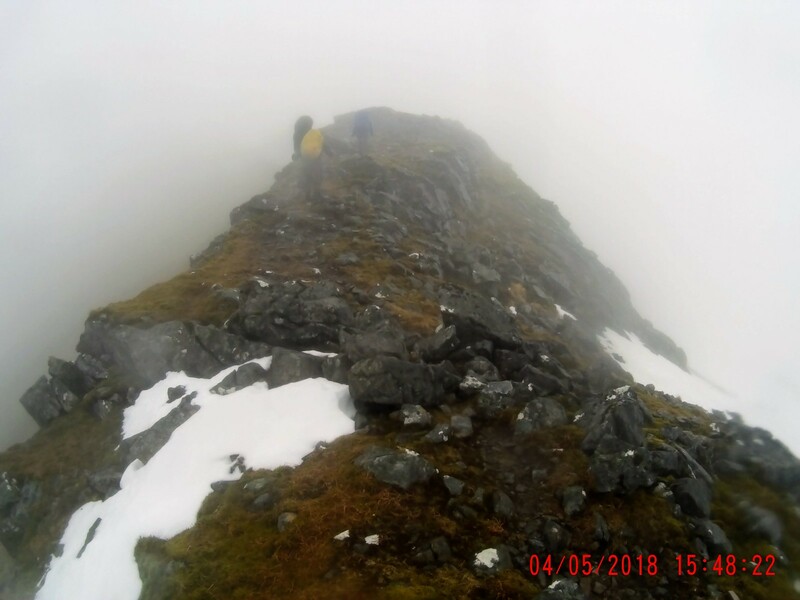 While walking along Beinn Bheoils long ridge the route was quite clear but now when there was just a large flat area with large fields of snow where we could not see the edges due to the limited visibility. So on Ben Alder we had to rely on our GPS units of which we had 3 with us all equipped with spare batteries and OS maps. 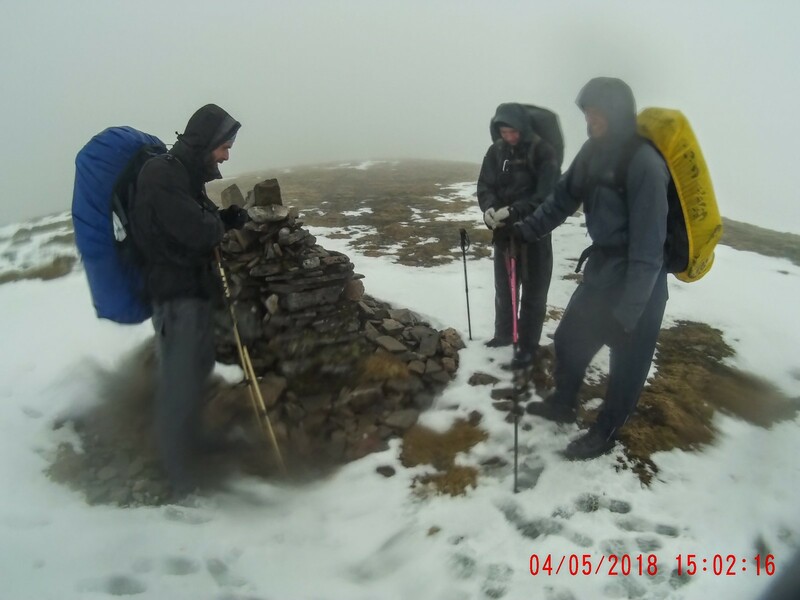 I can clearly say that without them it would have been impossible to find the summit or to make things worse to find any route. 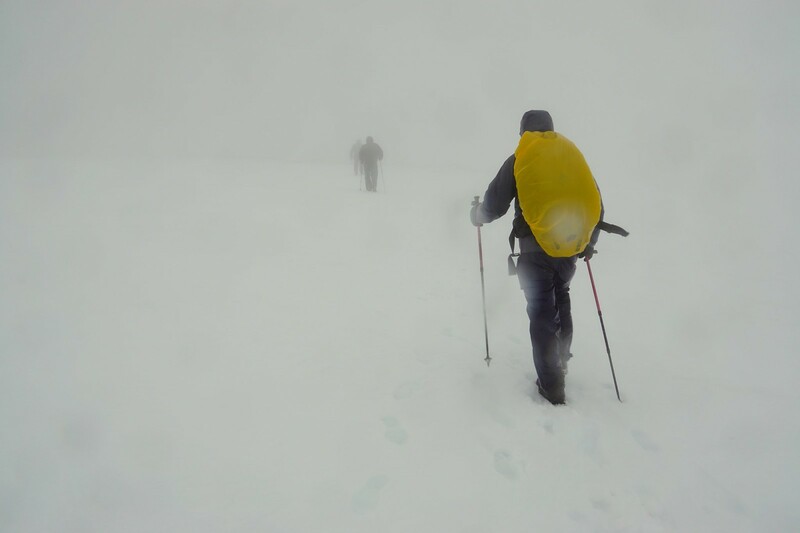 Because the vivisibility was limited to 50m and in some places maybe only 20m we had whiteout conditions on the large snowfields and therefore we tried to stay away from the plateau edges in fear of cornices. Finally we saw something black in the distance and were surprised to find out it was the summit cairn only a couple of meters away. Relieved to have found the summit we had a quick look at the map and discussed whether we should continue west and descend via Bealach Dubh or head back and follow the route we came up the mountain. We decided to go for the second option. 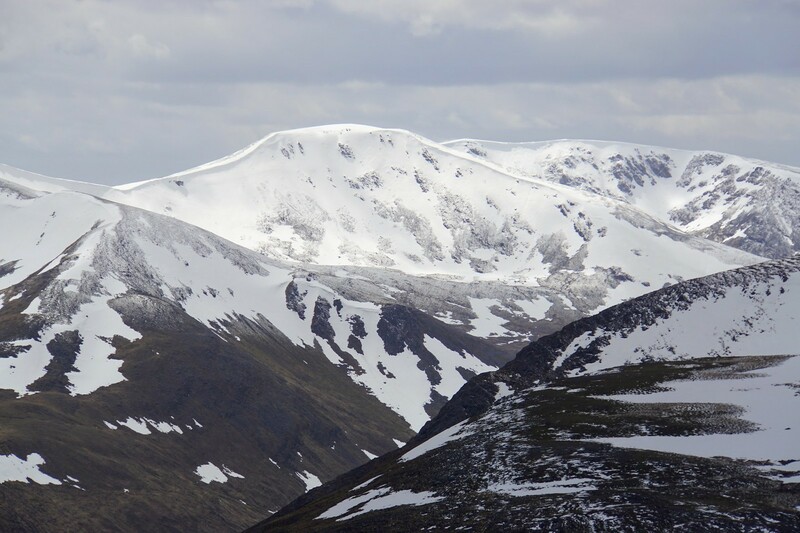 That also meant that we would not attempt the remaining 4 Munros to the north today. 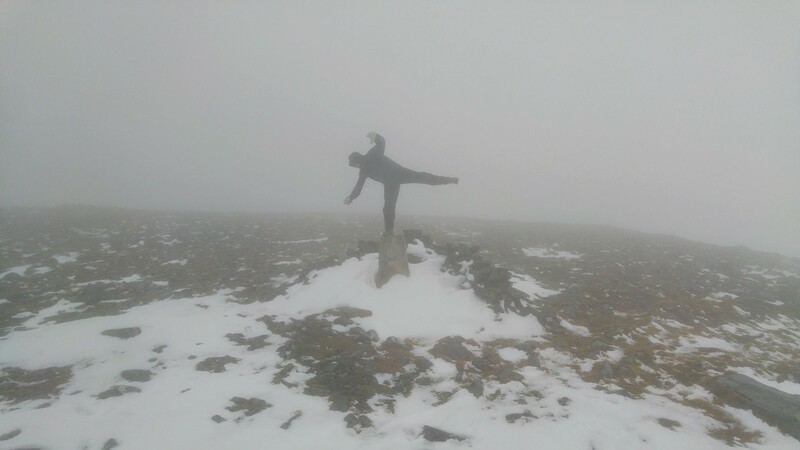 Contemporary Art on Ben Alder? Nah, just my mate. 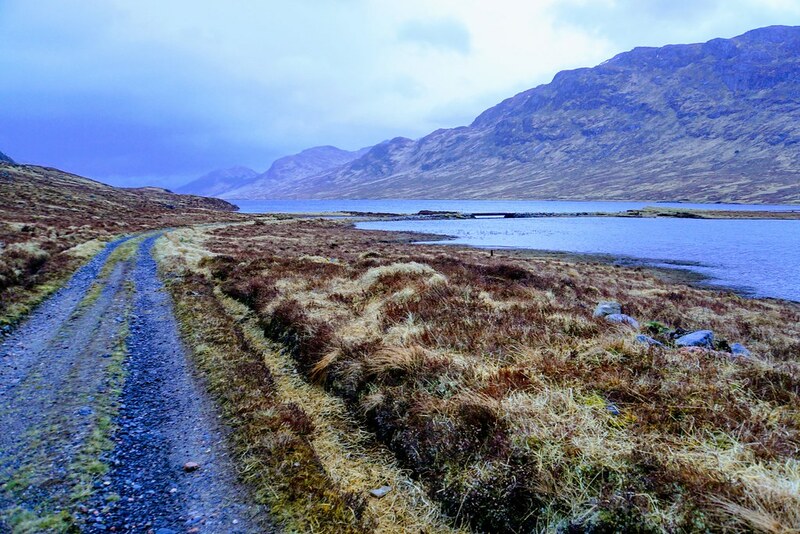 We retraced our steps back to the bealach and from here we followed the clearly visible but very wet and muddy path down to Loch a’ Bhealach Beithe. Once here I was glad to have left the summit area behind. It wasn’t scary up there, it just felt dangerous. Not being able to see where to go combined with being wet and cold is just not my favorite activity. 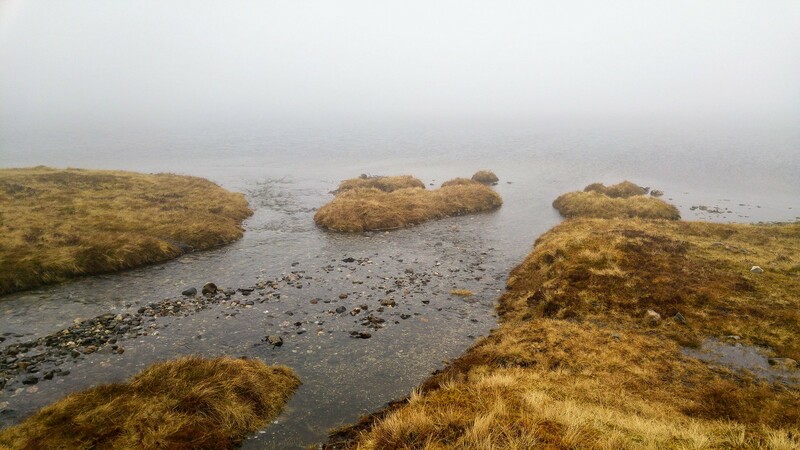 Visibility was still very low and so all of a sudden we realised that the apparent slope to the left was the dark water of the loch. Walking along the lochs shore took ages and felt a bit strange because we weren’t able to see the opposing side of the lake. It just seemed to stretch into nothingness. 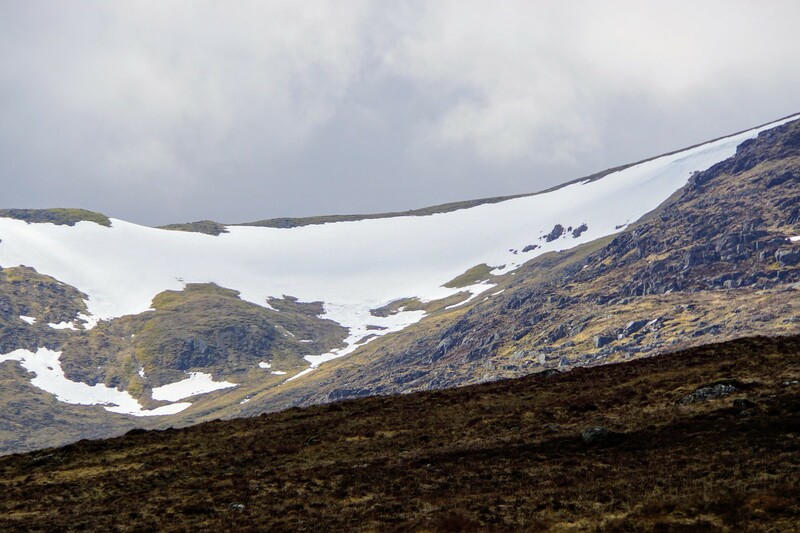 When we came to the northern end of the loch we followed the path and saw some large snow bridges over the river. There must have been quite some snow this winter in the mountains. Snow bridges over the burn. I wouldn’t dare to walk across. 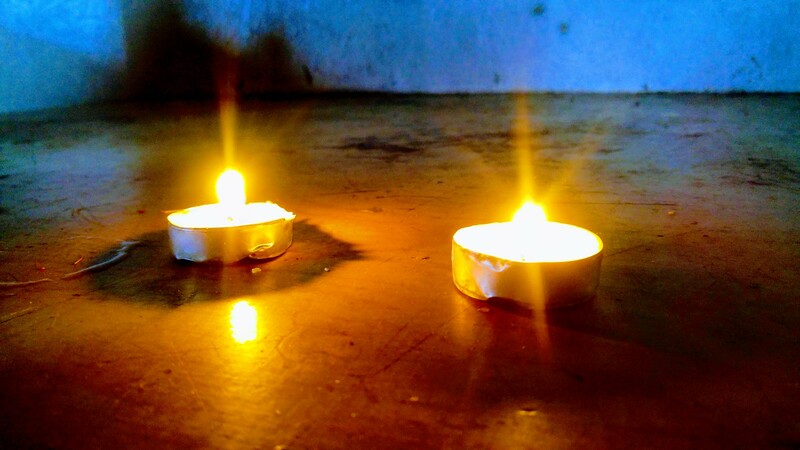 In the Bothy. Screw the asbestos! Dinner is served. Outside of Scotland I wouldn’t touch this. But here in the wild with no alternatives it’s delicious. Now the visibility got better and shortly after we were able to see the bothy in the far distance. 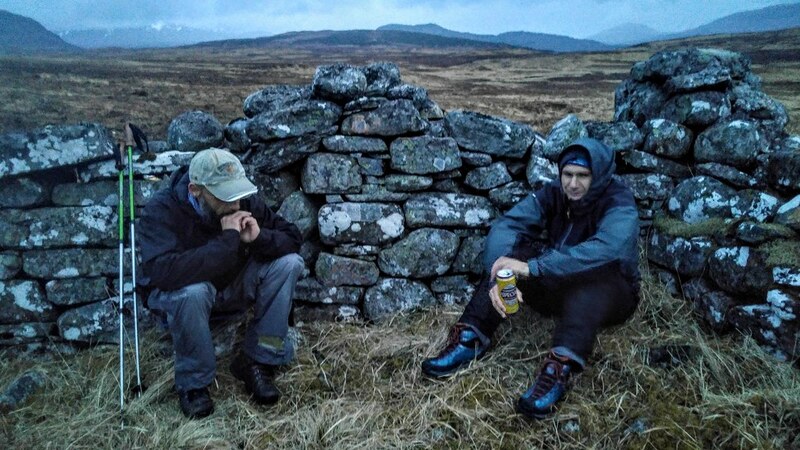 The remainder of the walk was not worth mentioning and when we finally arrived back at the tents we decided to retreat to the bothy at least for having dinner. The bothy is really cosy and would have been an nice place to stay. I really loved it in there. I can imagine its a place filled with stories about the mountains with a fire going and whisky being handed around. 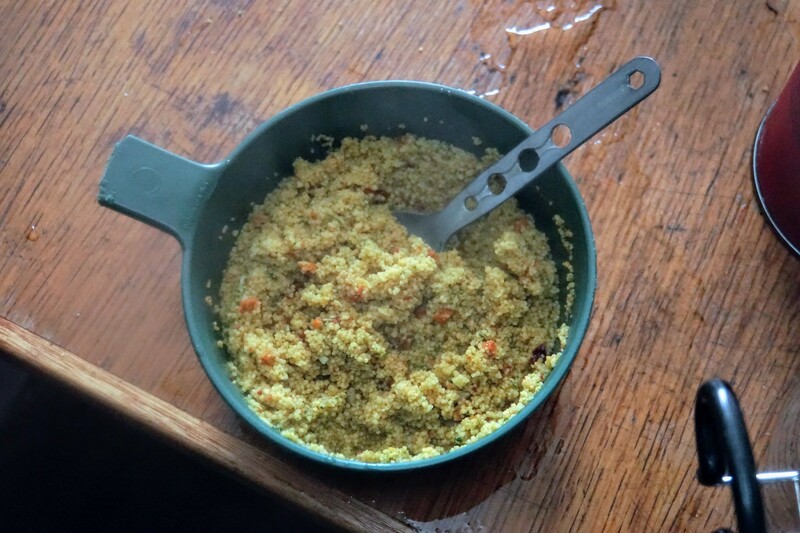 We had a soup and some couscous along with some whisky (Laphroiag select) and after maybe two hours we went back to the tents and enjoyed a good night's sleep. The next morning was no different from the previous one although I had hoped for better weather. The cloud ceiling was still so low that we could not see any mountains but there was no rain and it wasn’t as cold as before. While we enjoyed our porridge the clouds partially lifted and we could see the top of Carn Dearg but soon it was hidden in the mist again. 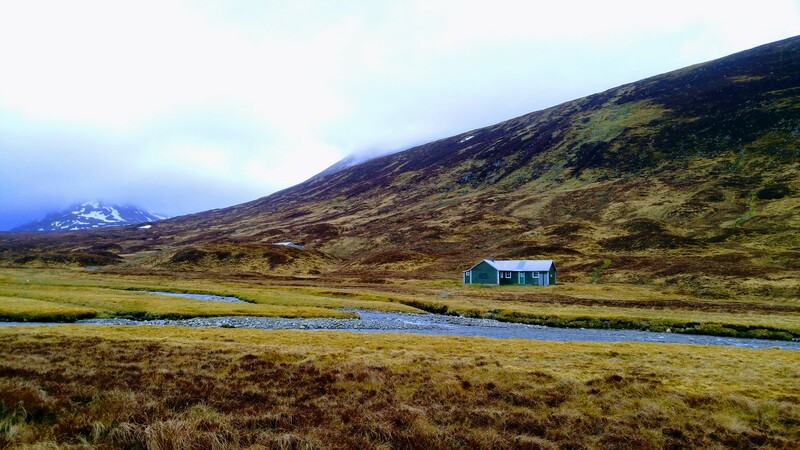 Today we had to leave the Culra bothy behind where we had camped for 2 nights. 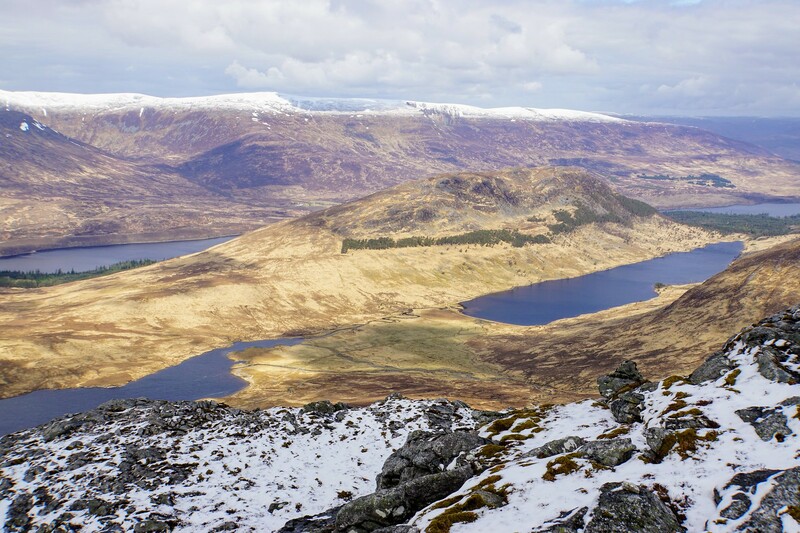 Our plan was to ascend Carn Dearg and follow the ridge all the way to the west Ossian valley. A new morning with the same weather. 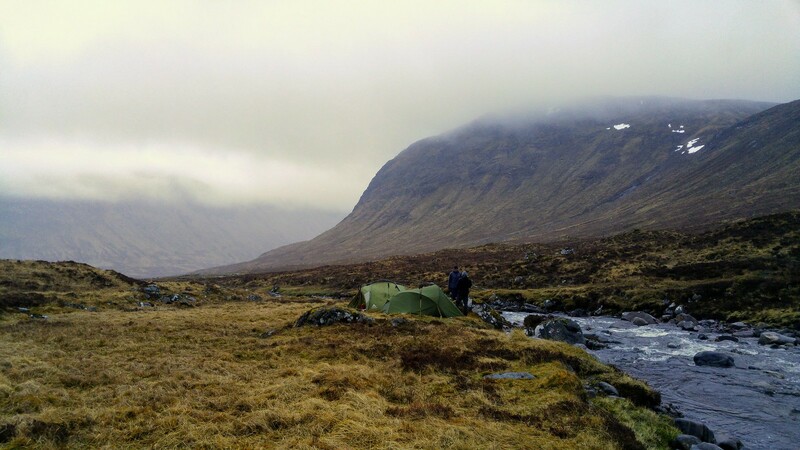 Leaving our camp near Culra Bothy. So we packed our gear and headed west. While leaving we met a group of three walkers but I assume they must have been german (just as we are) because they just said Hello and were nowhere as friendly and chatty as the Scottish would be. Half an hour later we met a young couple who were probably german as well because they were also not very communicative and just said Hello. Where the two burns meet. 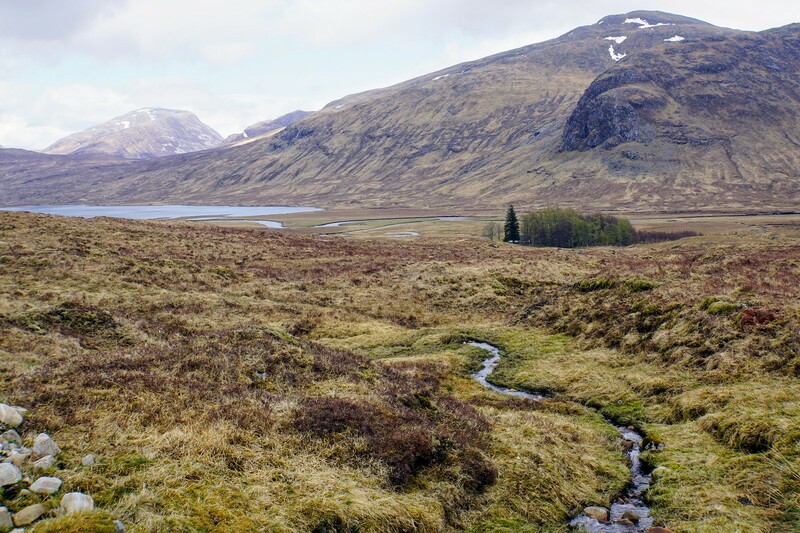 We left the valley where the burn from Loch an Sgoir meets the river and followed the burn all the way to the Loch and from there to the ridge at Diollaid a Chairn. Now it was time to leave the rucksacks behind and go for Carn Dearg. The summit was roughly 2km away but without the heavy gear walking was easy and within 40 mins we were back at the rucksack hiding place. Ah, I forgot to mention the views. There were none. 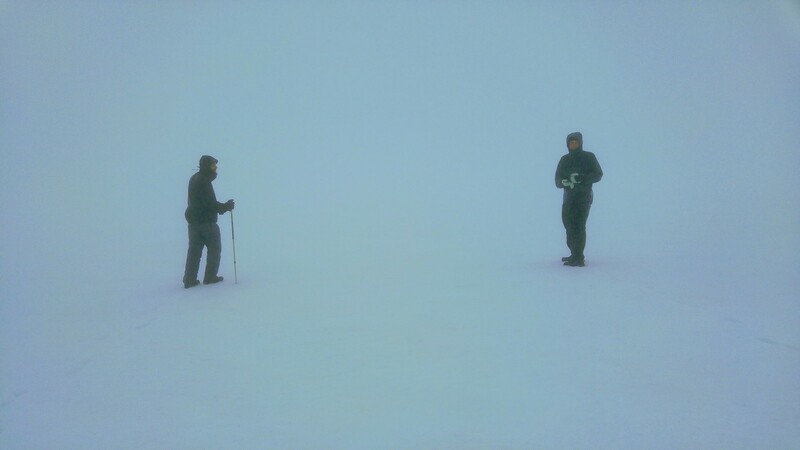 Visibility was down to 30 to 50m and so we followed the map on our GPS units. 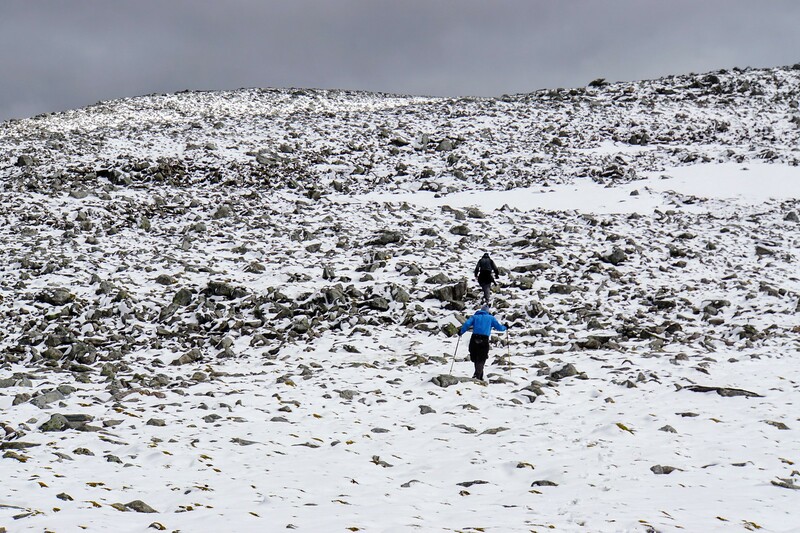 The ascent to Geal Charn along the ridge between the 2 Lochans was quite demanding and steep. 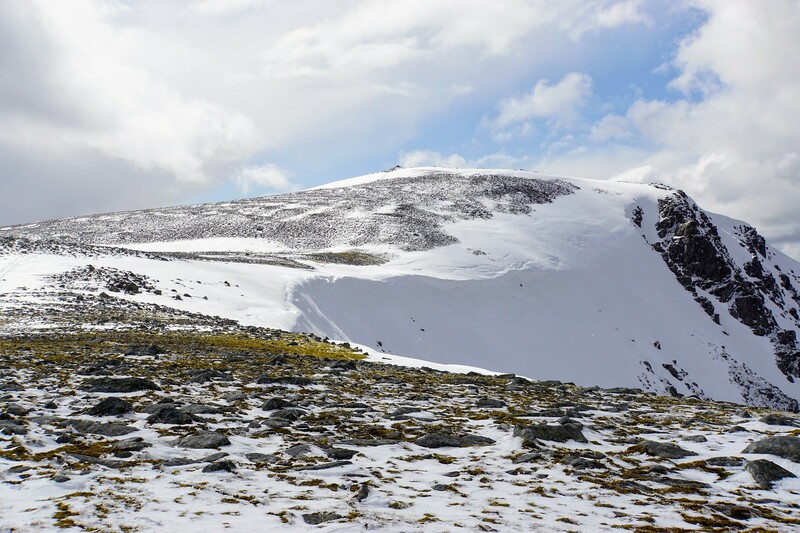 I had no idea how far away the summit actually was when we encountered a large and steep snowfield that we had cross. We tried to find a way around but there was snow or rocks and steep slopes on both sides. So we had to cross the snow and because we couldn’t see very far we had no idea what lay ahead. 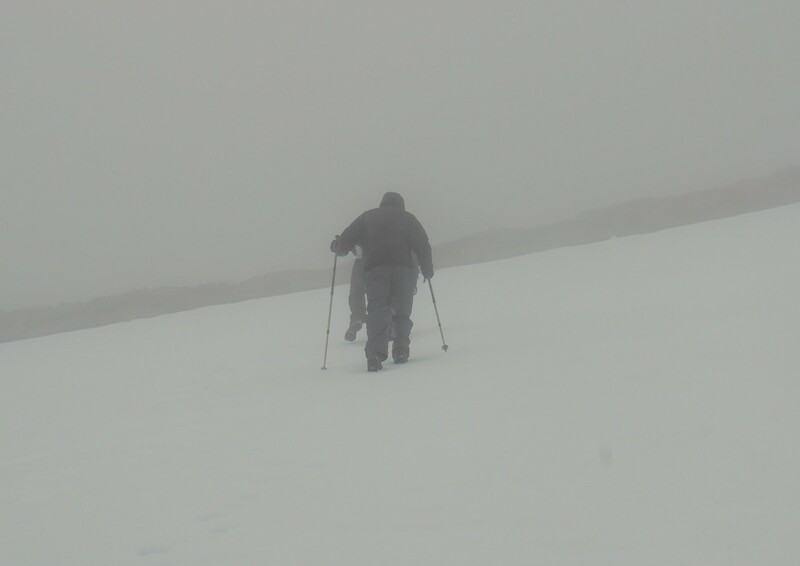 In addition we had no crampons or ice axes with us and so we just rammed our boots into the snow gripped our hiking poles tight and crossed the snow field. The steep part wasn’t very long but the snow field stretched out forever (well, for the 30m we could see). A moment of silence for our fallen friend that we miss so much: SUNSHINE! 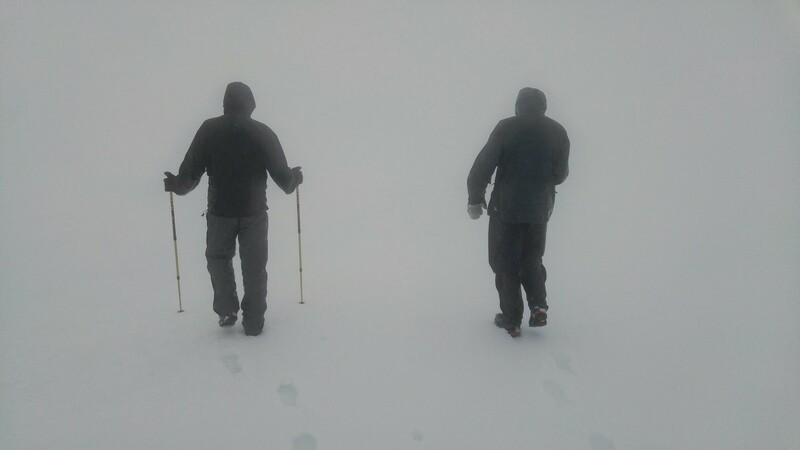 As the day before we had whiteout conditions and had to rely on our GPS units to find the summit of Geal Charn. As said, conditions were similar to the day before but without the rain. 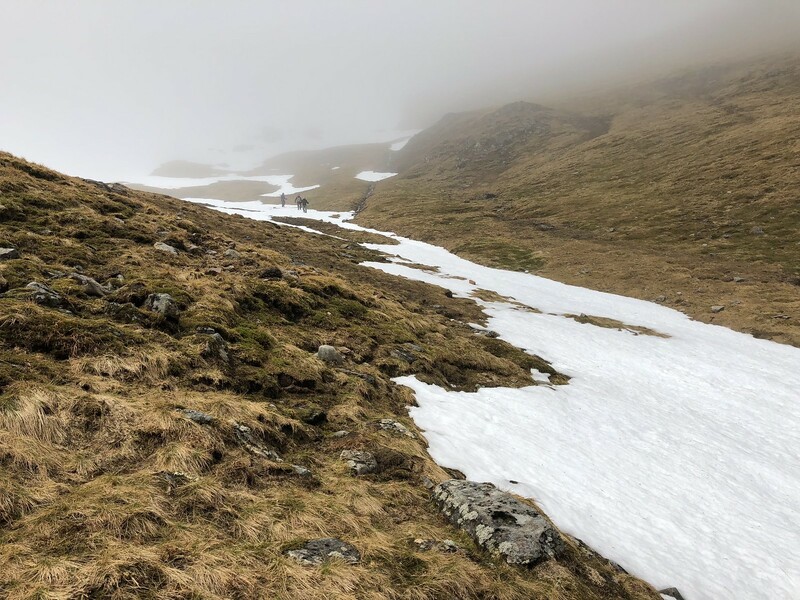 I can’t remember much of the next 2 Munros apart from that we followed the ridge without too much snow and walking was easy but dull. No views, only a few ptarmigans flew up from time to time when we came too close to their position. 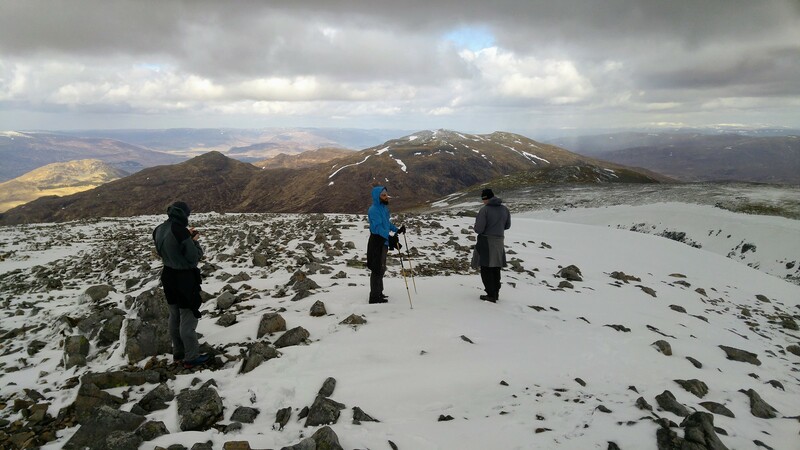 After Aonach Beag we headed for Beinn Eibhinn the last Munro on the ridge. This one has two cairns and we stopped at the second one which is apparently the lower one. After Beinn Eibhinn we knew from now its just downhill for the rest of the day. 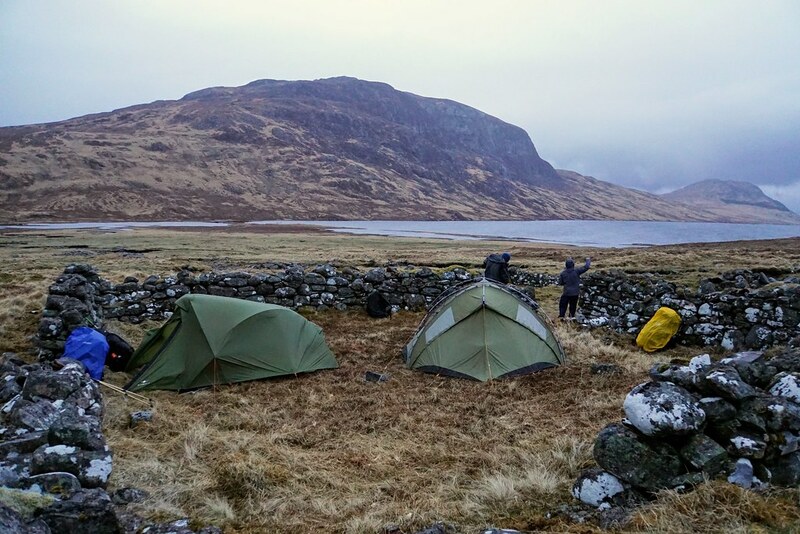 We had planned to camp near Strathossian House for this night. So we headed south to Meall Glas Choire, turned west there and traversed the slope to the 741m point at the end of Coire nan Nead. 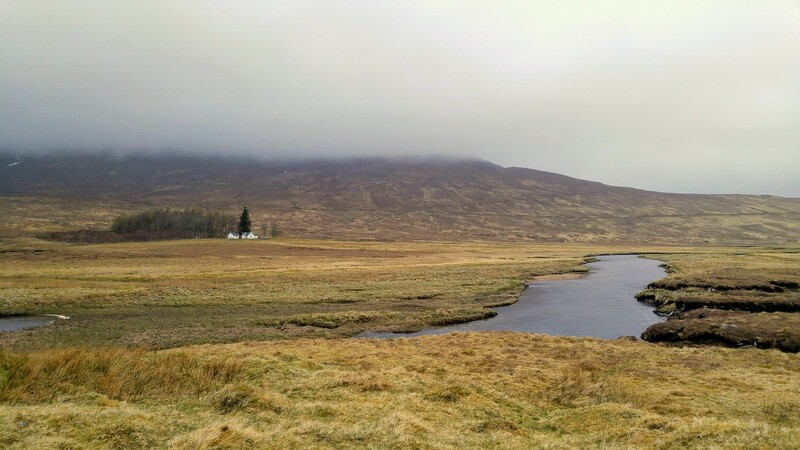 On that misty and dull day we were really surprised when the view opened up and we could see Loch Ossian in all its beauty. The remainder of the day is quickly told. 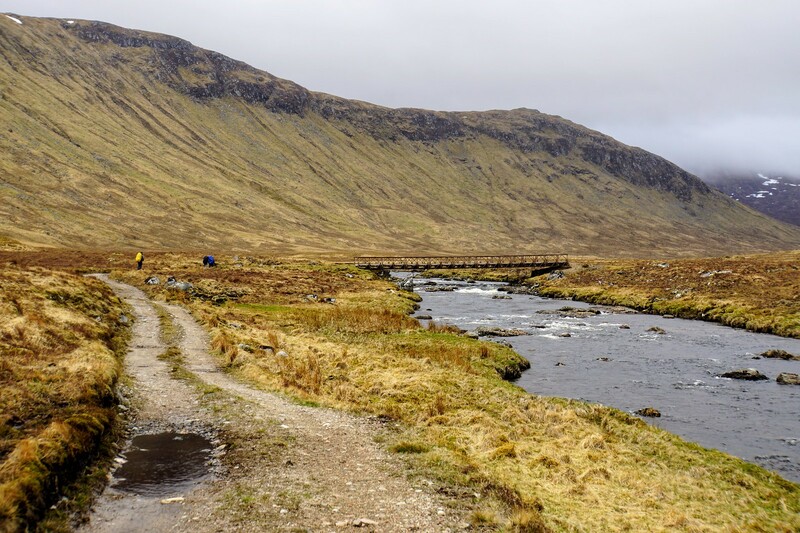 We descended in Coire nan Nead which was quite steep in certain areas and down at Loch Ghuilbinn we found a Landrover track which we followed west to a bridge over River Ossian. Exhausted as we were we strolled west along the track from Corrour and left the track at the bridge over Allt Feith Thuill. Some 200 meters from the roads and a nice grassy area right next to the river we put up the tents, had some noodles and some well earned sleep. 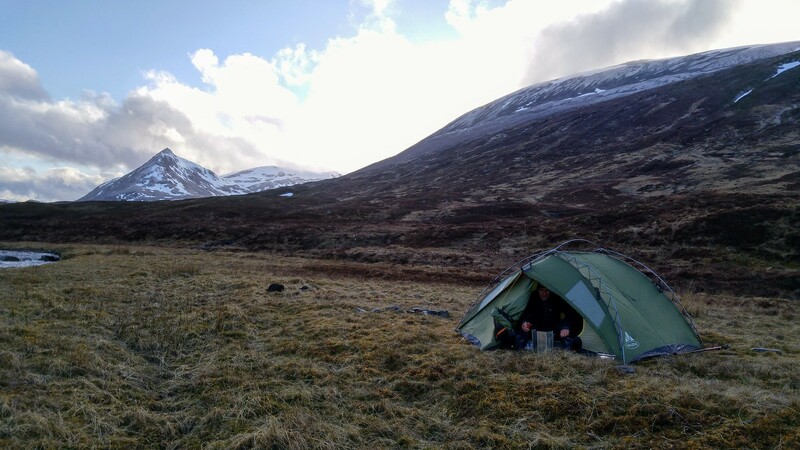 Campsite close to the Corrour track. 20 meters from the tents. The remains of our dinner. HAHA! Don’t worry, we had noodles. We set the alarm for 7am because time was a key element for todays tour. 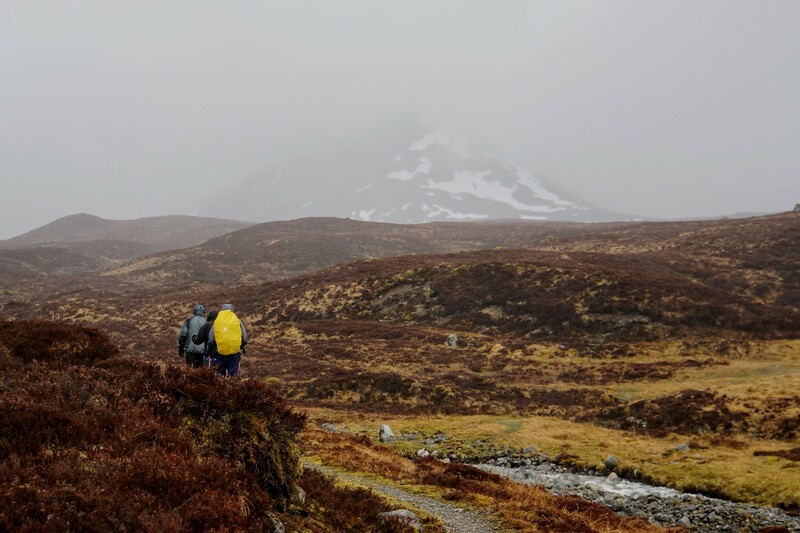 After the usual porridge breakfast we packed light gear (rain gear, cereal bars and water) and headed almost in a direct line to Chno Dearg. Well to be honest we just followed the Corrie on the east face. Walking wasn't to difficult, and feeling refreshed in the morning we almost flew up the hill. On the way I met George. George is a frog and a curious one as well. When I picked him up to take a picture (I love frogs) George had no better idea than to jump right into my open jacket. Somewhere between my t-shirt and my fleece George tried to hide and warm up a bit. As this would have been dangerous for little George I had to find him and because of his wet appearance it was quite a slippery affair to get George back out into nature. This is me looking for George! Things went from funny to serious again a little higher up almost at the end of the Corrie. 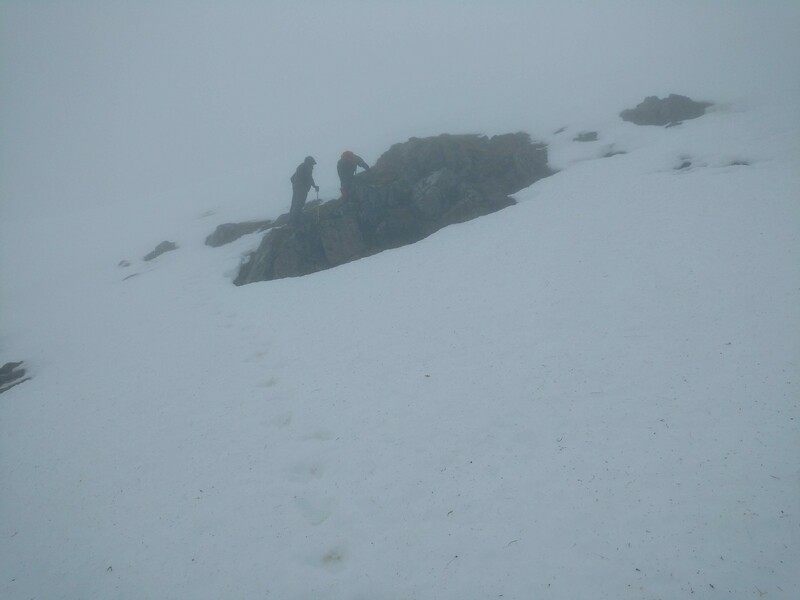 The further up we climbed the more snow was there and because the visibility was again down to not much (maybe 30m) we had to stop at a rocky area surrounded by snow because apparently from there is was only snow and we could not see how far the snow field stretched out. This would not have been a huge problem, but the snow was steep. It was so steep that I refused to climb up. 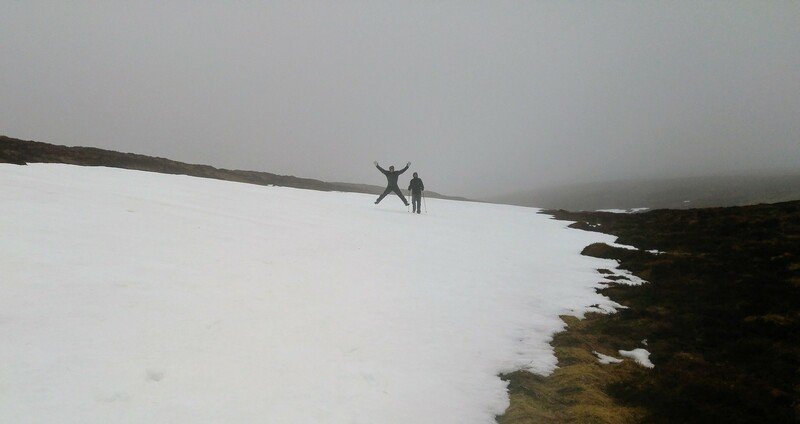 My two mates were not as faint hearted as I was and continued up the snow but for me this was not an option. 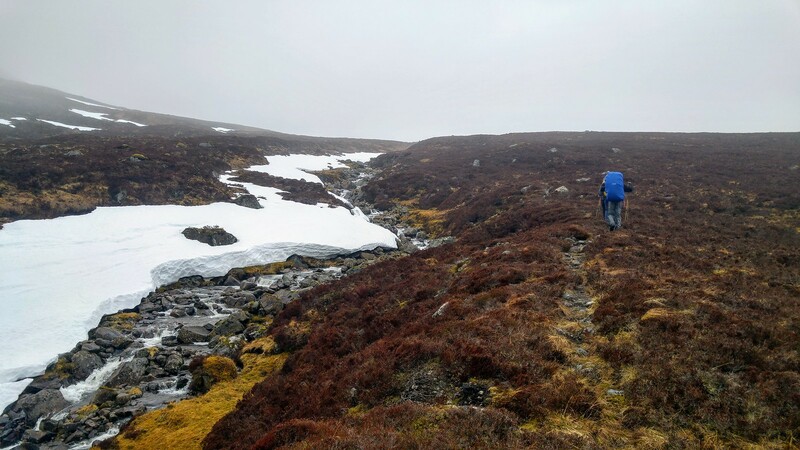 I feared that if I follow and the snow, although relatively hard it was also wet from thawing , would give away I would slide down with no possibility to stop my slide until I hit a rock with serious consequences. 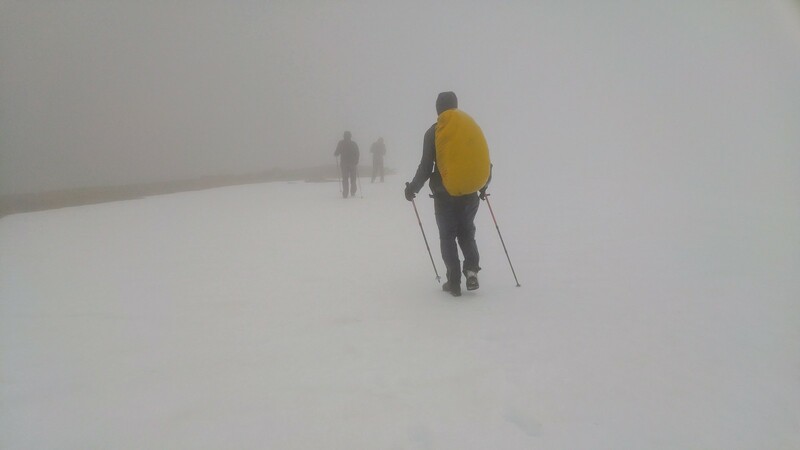 My third friend by that time had already turned right and headed directly for the summit so I was left along and could not see anyone. The snow field. Behind these rocks it was even steeper. A look at the map provided that clue how to solve this mess. To the left the slope was less steep and so I retraced my steps some 20 meters and turned left and crossed the snow field here where it was much less steep and crossing was possible without danger. 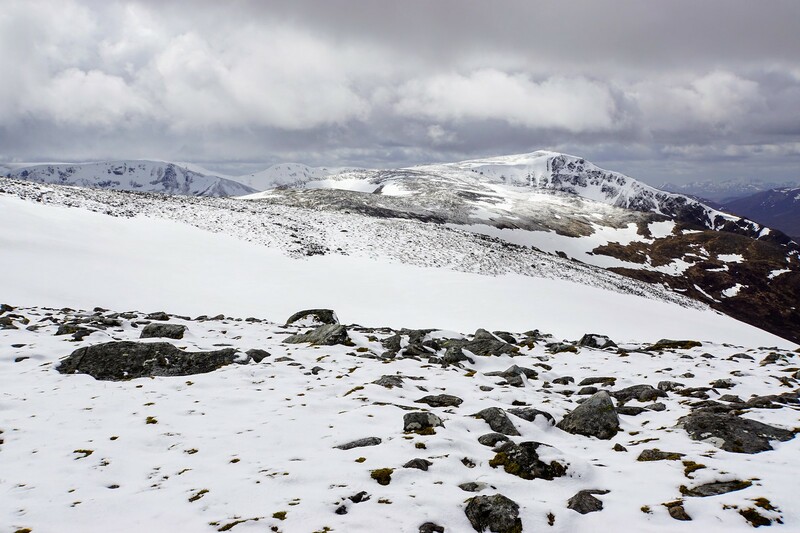 Once I crossed the snow I was standing on a relatively flat area named Sron Ruadh in the map. 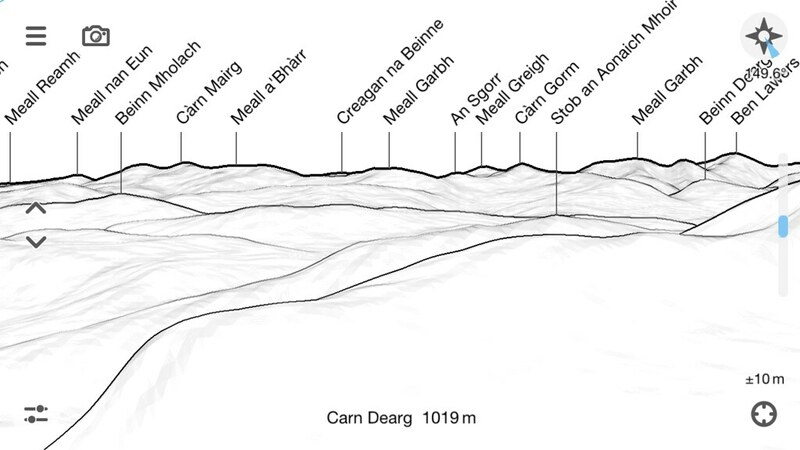 From here I relied on my GPS to find the route to the summit of Chno Dearg. Once I arrived there my two mates were already there but the third on was still missing although he should have been the fastest. So we discussed what to do and waited for a couple of minutes and just when we came to the conclusion that we have to turn back all the way to the point where we separated he stepped out of the clag. What had happened? 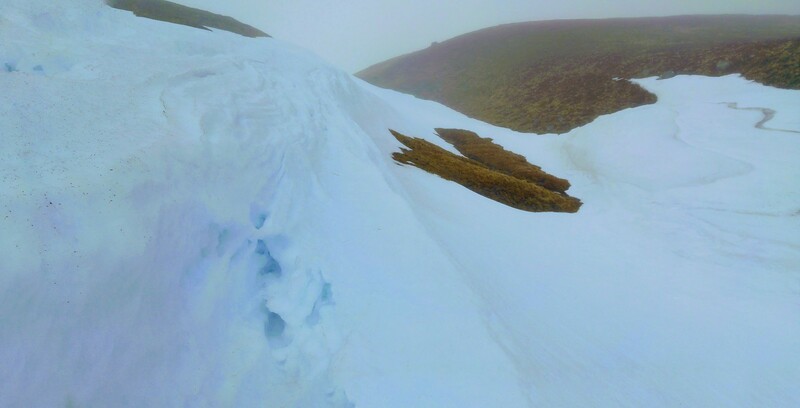 He tried to find a route to the even steeper snow field to the right and ended up at the lower end of a cornice. He realized that there was no way of climbing up and so he turned back and followed my steps. And so he was some minutes behind us. At the cairn there was no more time to be wasted and we headed to Stob Coire Sgriodain which we supposed was just around the corner. 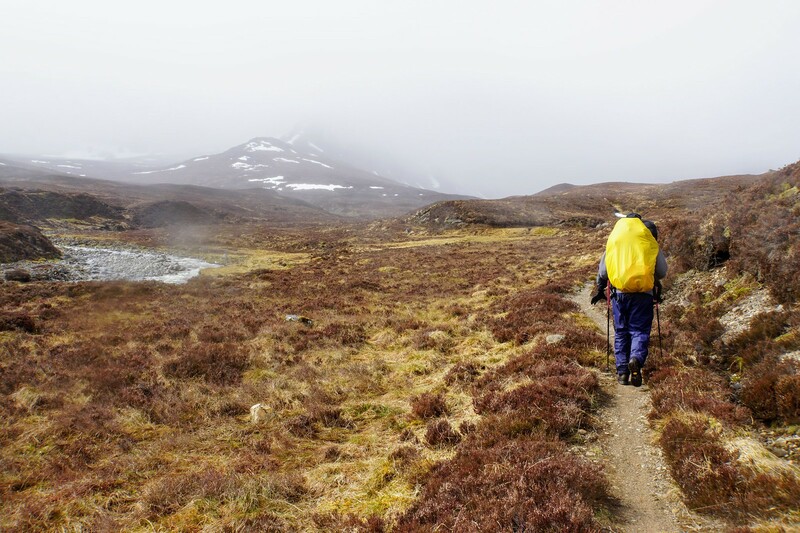 Descending from Chno Dearg we found a small path but this soon disappeared and we just followed the GPS. This made walking not easier. 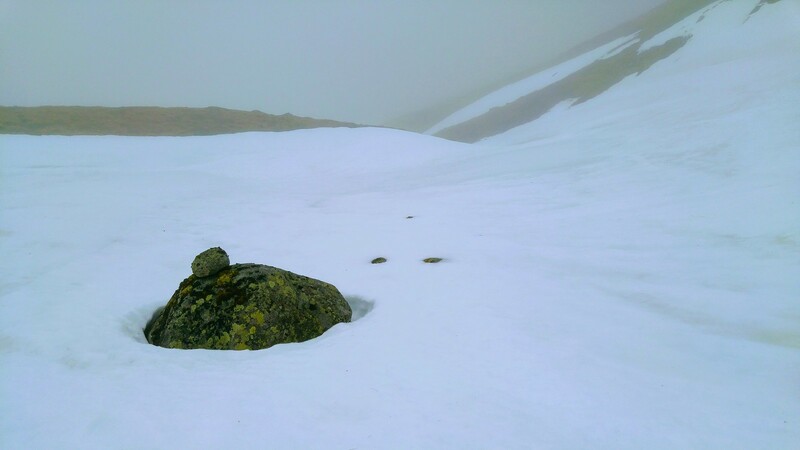 The terrain up there is rocky and combined with the low visibility it took ages to get from Chno to Stob. Some 100m before the summit we found the path again ( apparently we were always too far west) and were more than happy to stand to see the summit. Ahhhh. What a view. We could have had. Actually we saw nothing. There was no Loch Treig, Grey Corries, Ben Nevis and so on. One of us had a nice app called Peakfinder where the outlines, names and heights of the surrounding peaks is overlayed over the camera image. So we were able to see on the smartphone what the view would have been. 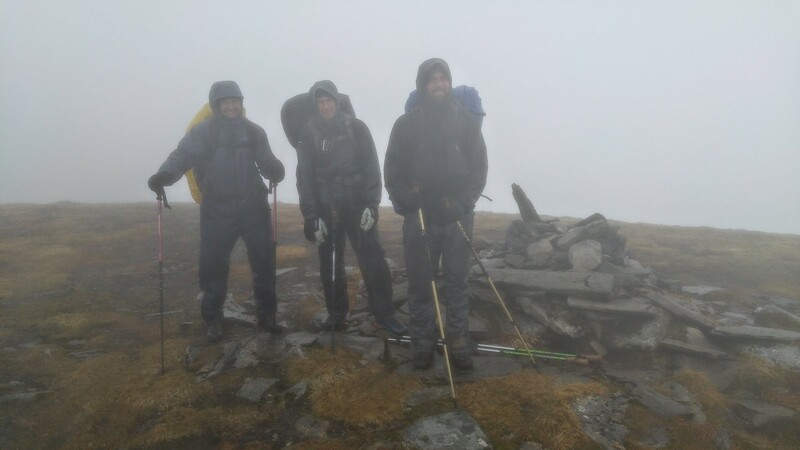 We raised the saxon flag for a last time (because it was this year's last Munro) and followed the path back to Chno Dearg. Walking was much easier this time because we followed the path. Near Sron Ruadh our sense of direction was deceived and we had already started to descend into the wrong Corrie further south than the corrie we came up in. The wind was blowing strongly now and we were literally blown up back to the ridge and from there it was easy to descend into our corrie. 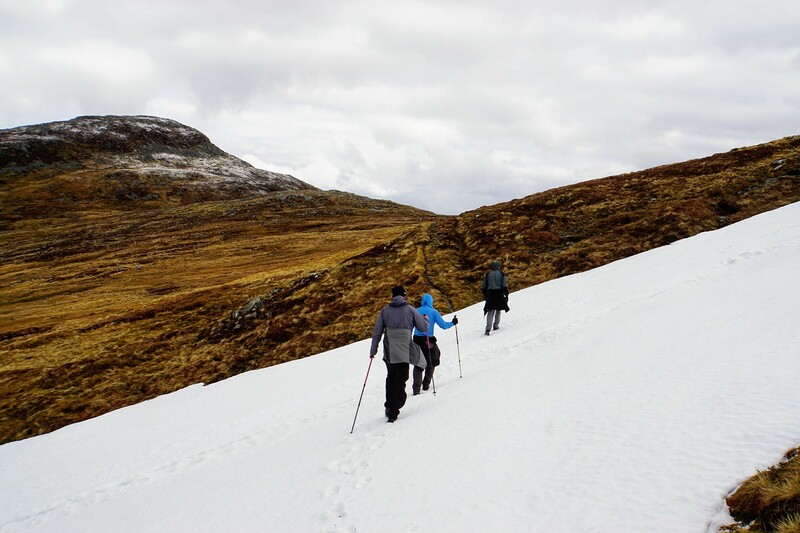 We even were able to retrace my steps through the snow field and from there it was just all downhill back to the tents where we arrived after some 3 hours. An hour after we left the summit the clouds opened up. ARGHHH! A glimpse back to the ridge. 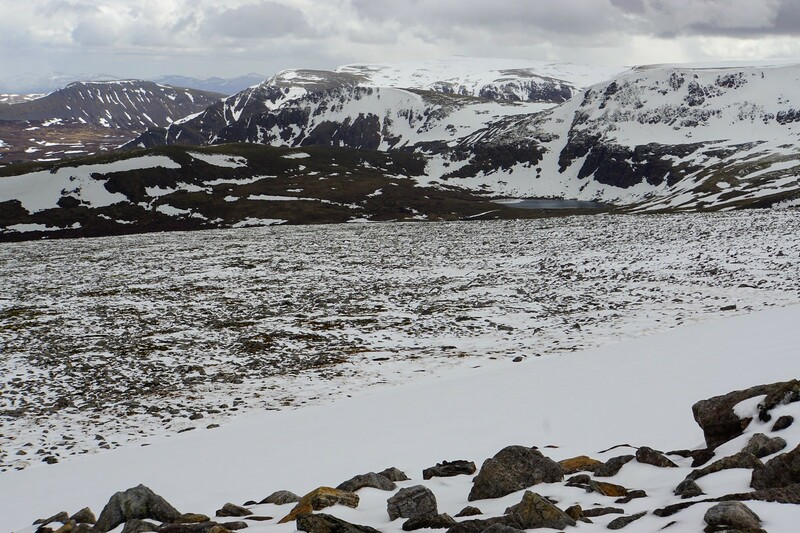 Even the snow field below the cornice and the rocks can be seen. Doesn’t look very dramatic. In the mist however it was scary. I walked left from the rocks, my two mates straight up to the ridge and our last friend tried to find a way to the right but had to turn back and follow my steps. Chno Dearg. Looks almost lovely now. What a difference some clouds make. 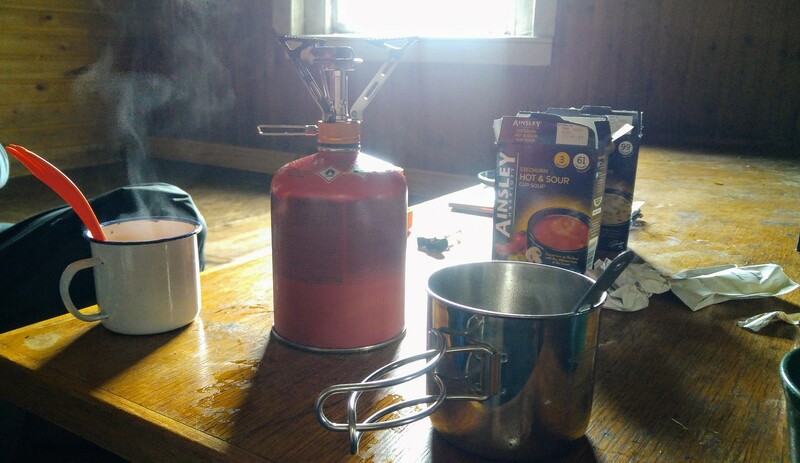 There we boiled some water for coffee and soup before we packed everything and start our long walk back to the car. 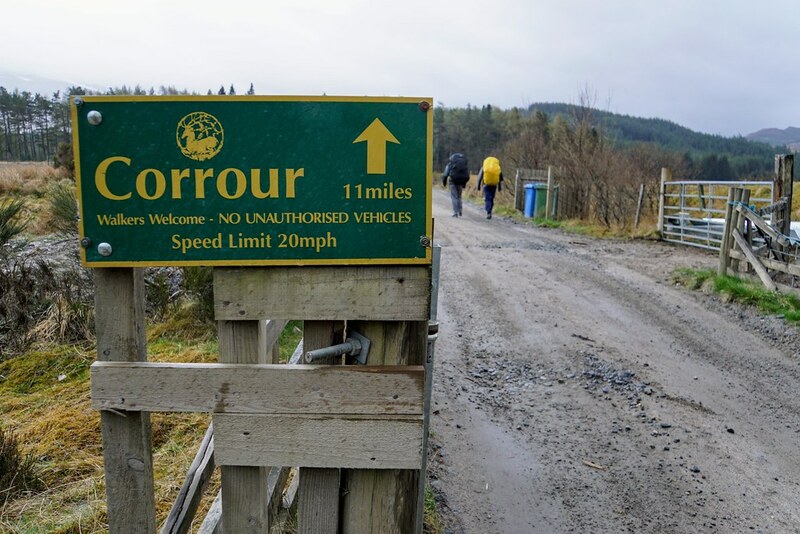 Basically it was just following the wide dirt road from Corrour to the A86 but it was still a very long (14km) and rather uneventful walk back to the car. A last glimpse back to the snow field. You can even see my footsteps. Ever heard of Sustainable forest management ? The hard road was in the end quite painful to the feet. 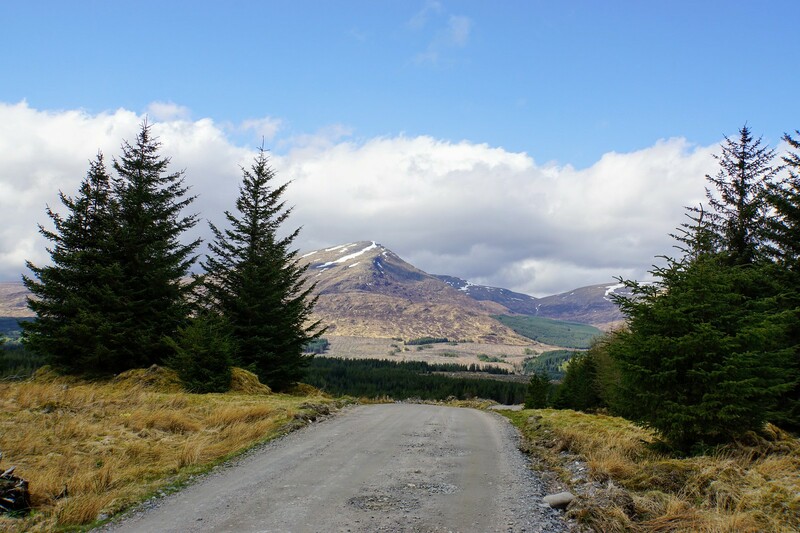 Distant Mountains, maybe the grey Corries and neighbours. 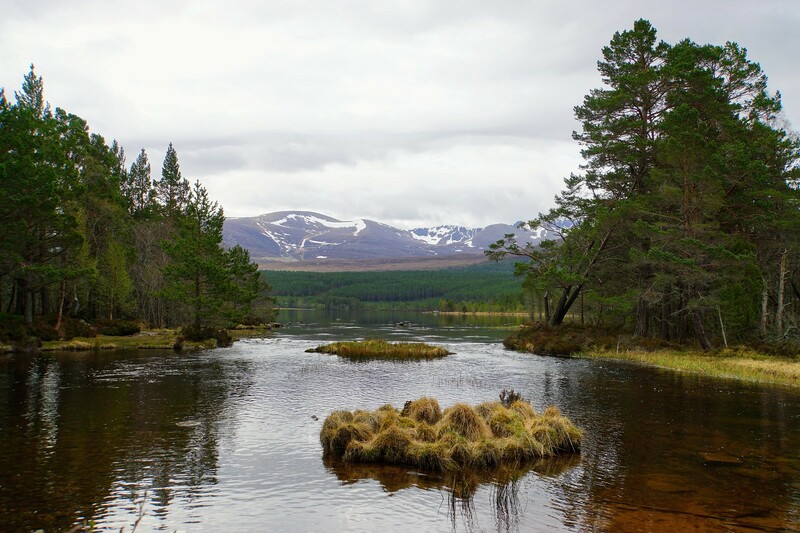 From our layby at the A86 we drove to the Glenmore Campground in the Cairngorms simply because we’ve been there twice in the past and knew they had hot showers. So we arrived there some time later and put up our tents in the usual spot. What shocked us, was the fee for the night. It was 72 pounds for 2 tents and 4 persons! Wow! That is expensive. The receptionist told us this is because of the bank holiday. Reborn in the shower in good smelling clothes we headed into town and luckily got a table at the MacDui’s in Aviemore where we enjoyed Haggis, Burger, Crumble and some pints of fine local Ale. After that feast we were more than ready for our sleeping bags. Day 5 - See ya, Scotland! The last days was just travelling. We started in Aviemore and stopped in Perth at the local Tesco to buy the usual souvenirs for our loved ones at home (tea, hot cross buns, whisky, porridge, haggis, etc.). From there we drove to the airport, bought another set of souvenirs and flew back home. 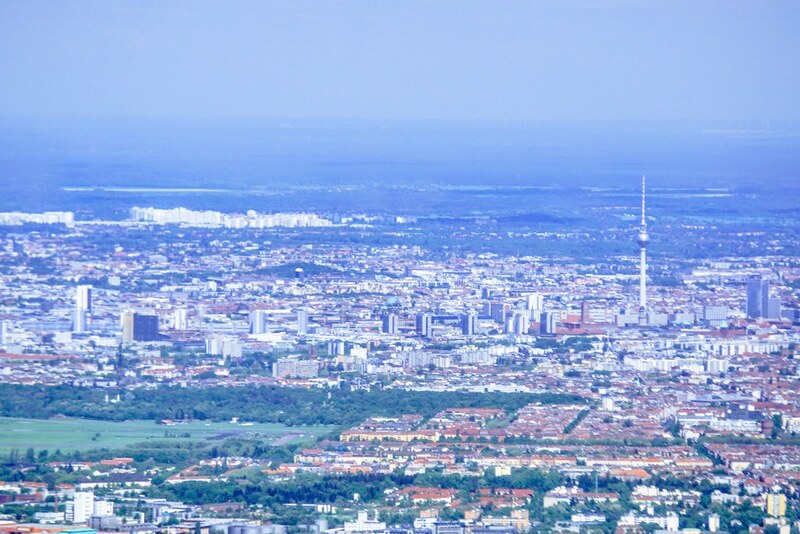 This time without paying 200 pounds penalty fee for late check-in and without lost luggage in Berlin. The last of us arrived around 21.30 at home. This years walking trip will not be the one that I'll remember immediately when someone asks about Scotland. There were better years with better weather in the past. But of course it was still enjoyable and the tour was demanding but as mentioned multiple times before the weather did not play ball. But this is just another reason to look forward to next year. I've been waiting for this report ever since you asked me about access to Culra some months ago - I was beginning to think you might have chickened out . 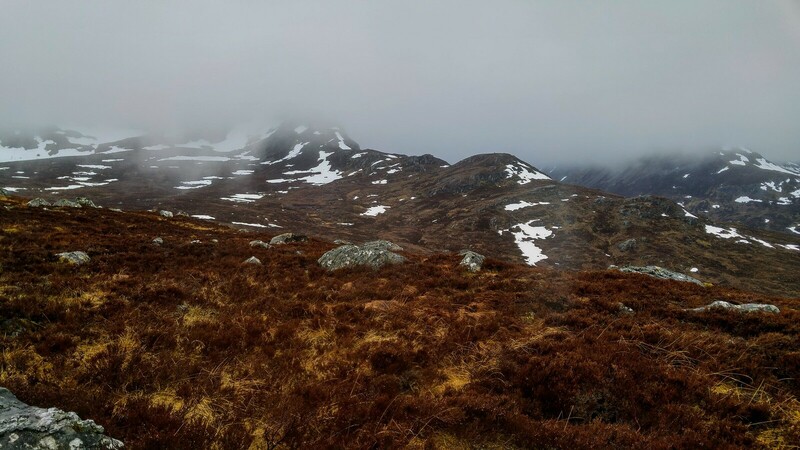 A pity you had less than ideal weather in which to experience what for me is one of the finest areas in the Highlands. At least day 1 was reasonable! I feel a twinge of guilt, having just enjoyed a couple of days of tropical sunshine in the same part in the North West. Mind you, you did get such amazing weather last year that I guess it was payback time really . Like Rockhopper, I'm stunned at the weight of your sacs! 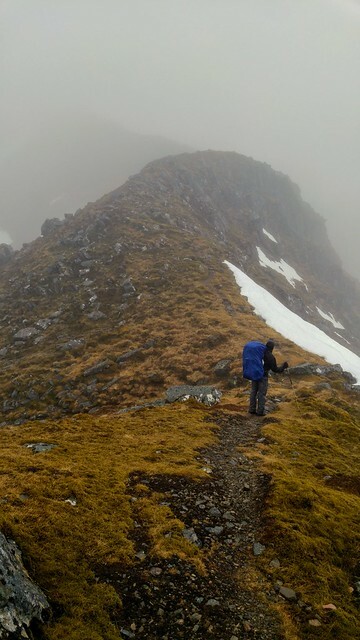 I have once carried 20kg, but that was only for a couple of miles (and it was only because I had a load of climbing as well as camping gear). Having just lugged something like 15kg around for a couple of days, I've decided that's quite enough for me! As per usual, the report makes a very amusing read - I like your use of bananas, unfamiliar over here . Great effort and good read! Unfortunately the weather was more scottish than it should have been. People asking for advise on WH get scared of midgies, so they don't come between June and August. And optimising packweight will get you far. 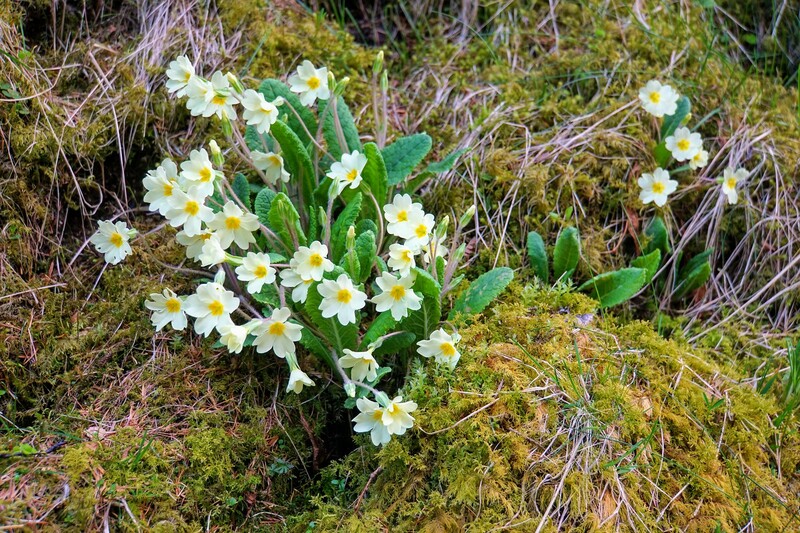 Excellent descriptive report, your annual trip is always one of the highlights of the year. 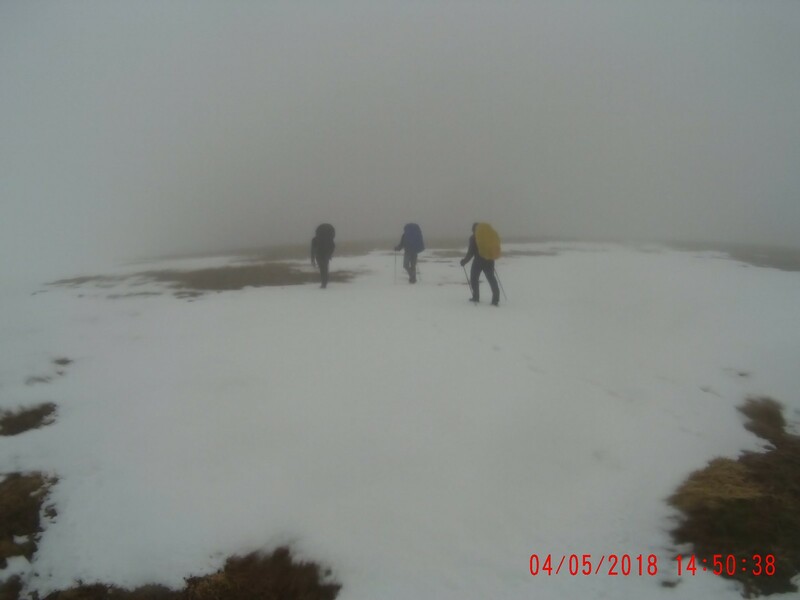 Was surprised at how much snow was lingering, however I was not surprised by the low cloud, we have had quite a few walks this year in similar conditions and also like you we lost one of our group - for a few minutes. We also decided that it is vital to stay together as a group. 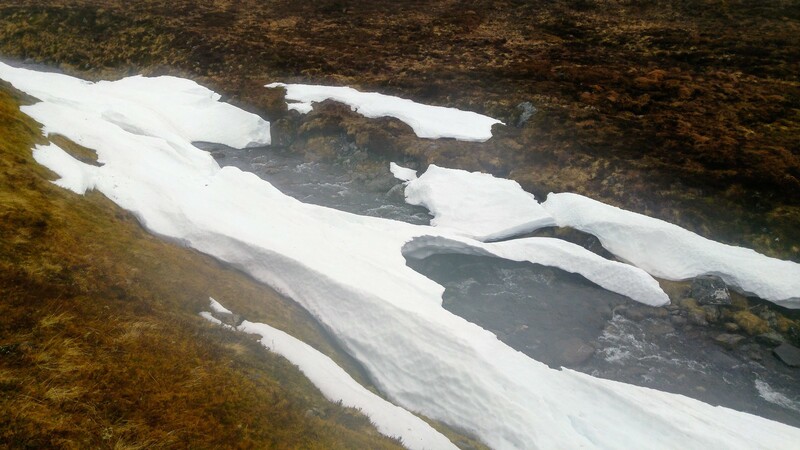 The asbestos warning sign has been on Culra bothty for at least 5 years, as it was there when I visited Ben Alder in 2013 in scorching conditions! Organising isnt such a huge problem. Its more or less booking flights and a car, shopping the food and gas and thats about it. After doing that for 8 years now we are used to that. Reducing the weight of the backpacks is another issue. I've no idea how to reduce that further without investing in ultralite gear that costs a fortune. Snow patch skier? Ok. That sounds like something these guys do to have some phtoies for social media but I cannot see the fun in it. Alteknacker wrote: I've been waiting for this report ever since you asked me about access to Culra some months ago - I was beginning to think you might have chickened out . Hey AK! 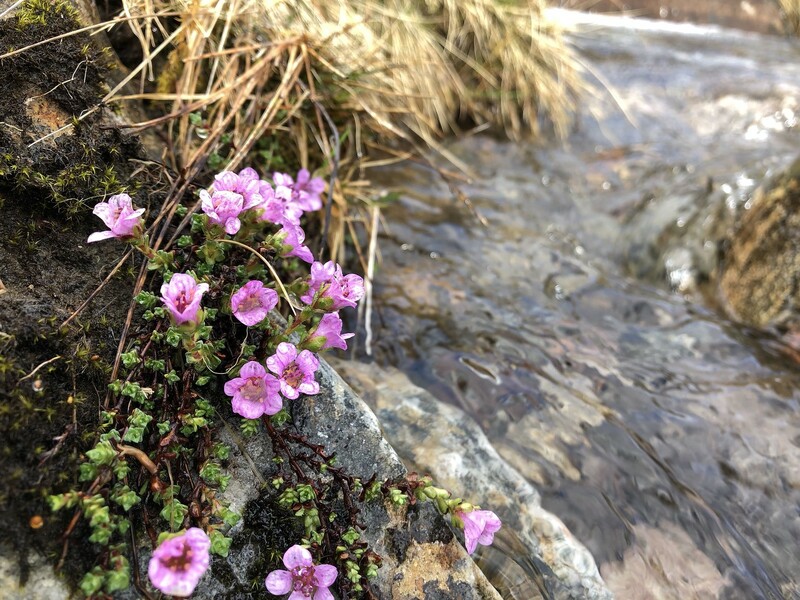 I just read TR from Loch Arkaig and I'm a bit envious. But as you said we had great weather last year so this year we were in for some rain. It was still a great walk though. The 20kg are reduced quickly. First of all I carried 2 cans of beer, which were emptied on the first and second evening. The all the food gets eaten and in when we got back to the car the weight was just 17kg if I remember correctly. However What worries me is the fact that I do not carry a tent with me and I am still at 17 kg. There must be something very wrong with my gear and for next year I'll have to reconsider my gear list. Thanks for the accolade. I like writing the TRs, makes me relive the whole trip. 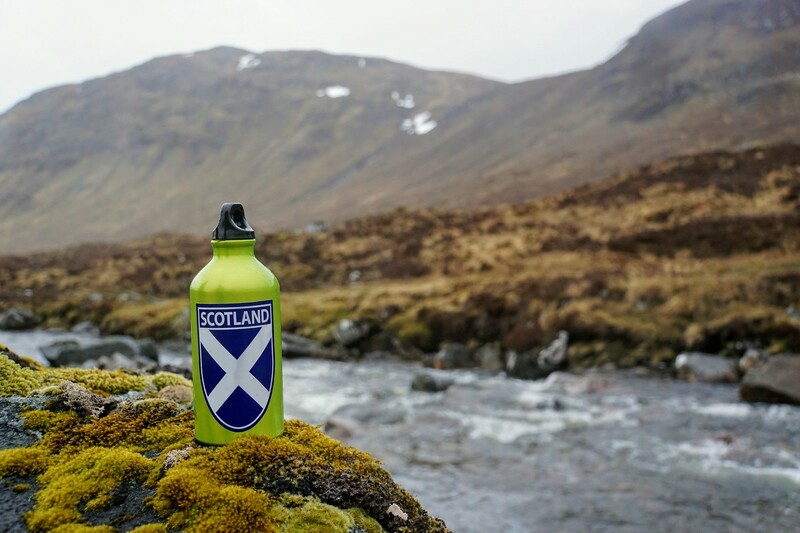 I also love reading your TRs (as well as a few others like Mountainlove) and although the usually kill my lunchbreak the give me plenty of ideas for the next decade of Scotland trips. Cheers walkingpoles. Thanks for your comments. Well, Your right ... 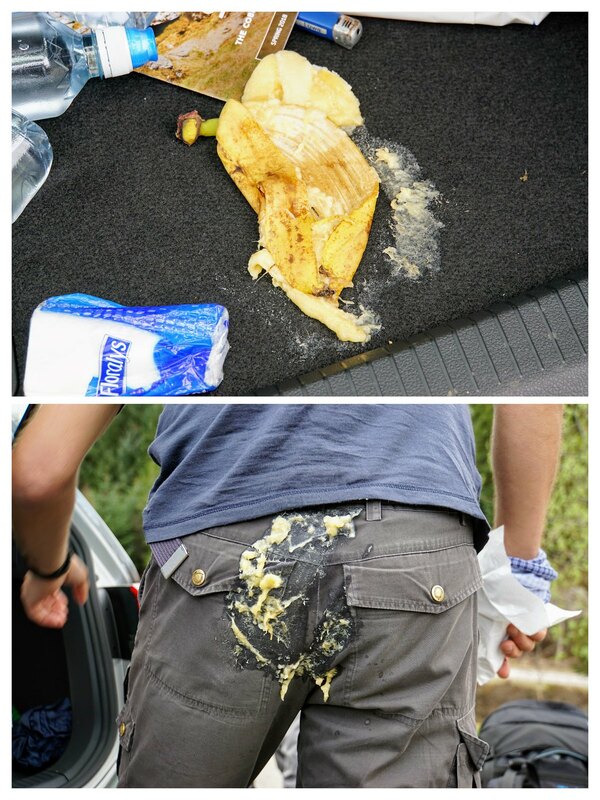 But the bananas were in the car not in our rucksack. And the beer vanished quickly. I had already tried to optimise during the last 7 years to reduce weight. E.g. the sleeping bag is a new one from Mountain Equipment weighing roughly 1.1kg. Concering clothes I just have a spare set of trousers and shirts. What weighs a lot is the electronic stuff. Powerbanks for smartphone and camera, spare batteries for torch and GPS, action camera, GPS and so on. I'd reckon thats where i can save some weight by reducing gear. And another point: We could optimise our equipment by harmonising our equipment. We do not need 3 stoves our 3 pots. I'll have a look into the CWT reports and try to find optimisation potential compared to my gear list. Great report mancunian, just a pity about the weather especially as the rest of May has been pretty good . It's a great area and I have been in there a couple of times this year already. hopefully you will manage again one day. All the best. Sunset tripper wrote: Great report mancunian, just a pity about the weather especially as the rest of May has been pretty good . What a wonderful view. It's a shame that we did not have such weather. But for me it's alright and the mist, rain, wind made the whole tour more adventurous somehow. Fife Flyer wrote: Excellent descriptive report, your annual trip is always one of the highlights of the year. There was a lot of snow but the constant low cloud was probably worse since it makes such a difference when you can't see where you're going. 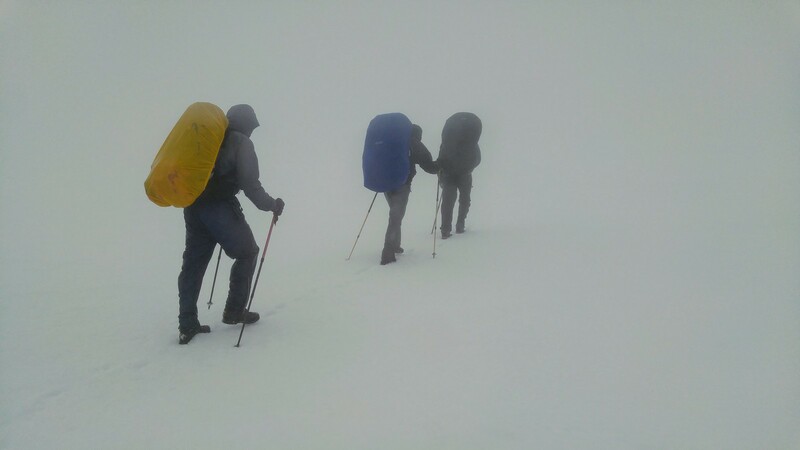 This happened on Chno Dearg when we couldn't see how to find a safe route around the steep snow field. Without the mist it would not have been an issue. 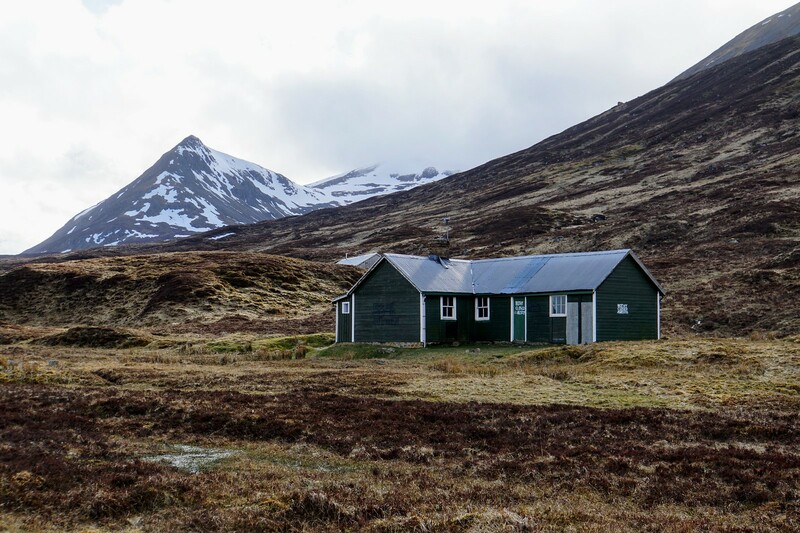 Its a shame that Culra bothy is closed because its such a nice bothy and I find it more inviting than Shenavall for example. But I can image that removing the asbestos would result in removing the whole building and building a new one in its place. That was a great report and what a pity you got so much of what I call "Scotland's favourite view". 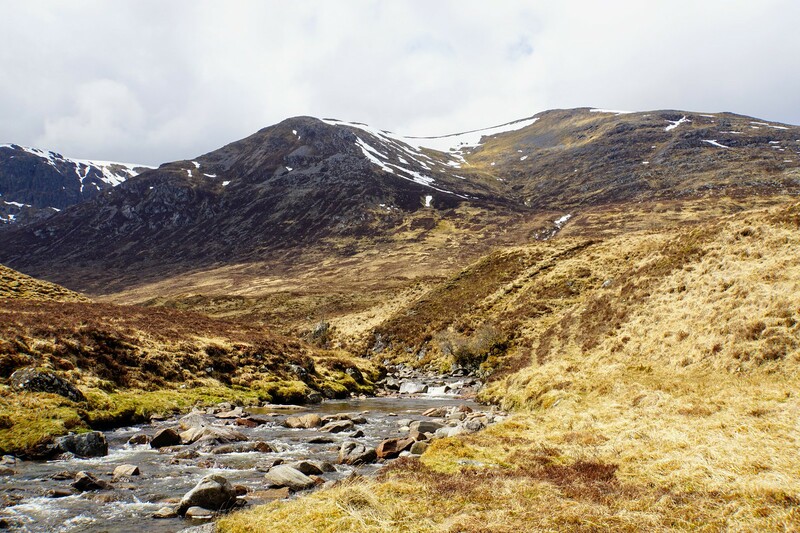 I have schemed up various possible routes for bagging the munros between the railway line and Loch Ericht and this is another one yet! mrssanta wrote: That was a great report and what a pity you got so much of what I call "Scotland's favourite view". I have schemed up various possible routes for bagging the munros between the railway line and Loch Ericht and this is another one yet! Cheers. "Scotland's favorite view" Thats good. 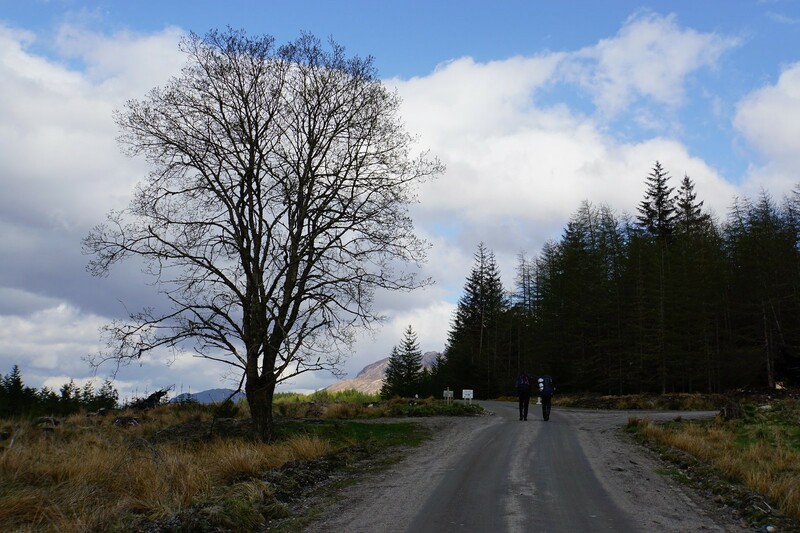 I'd say the main drawback of our route was the long walk back to the car along the forest track. It was ok for getting back to the car relatively fast but it wasn't a pleasure to walk nor for the eye. 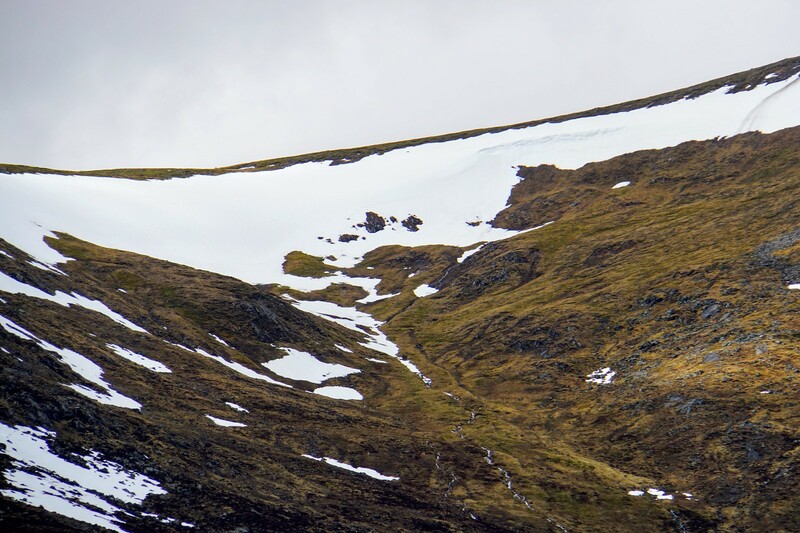 Wow, I admire your determination to climb the munros in that kind of weather. Great report as always.